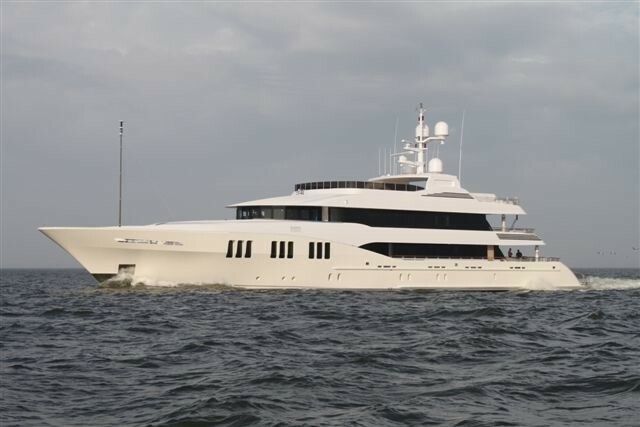 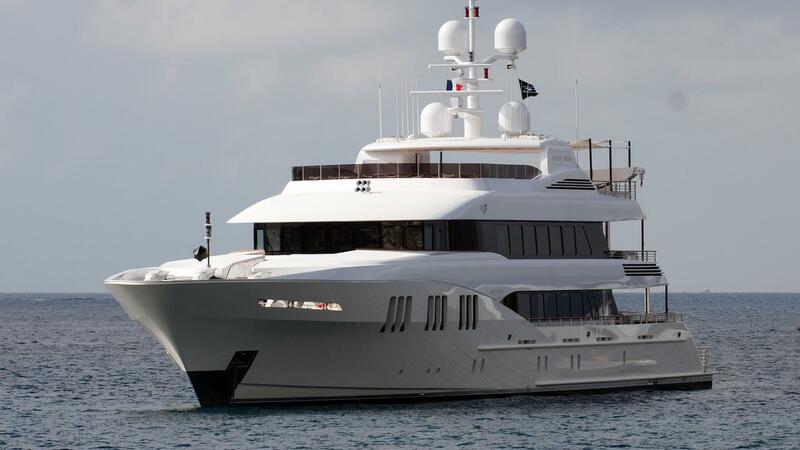 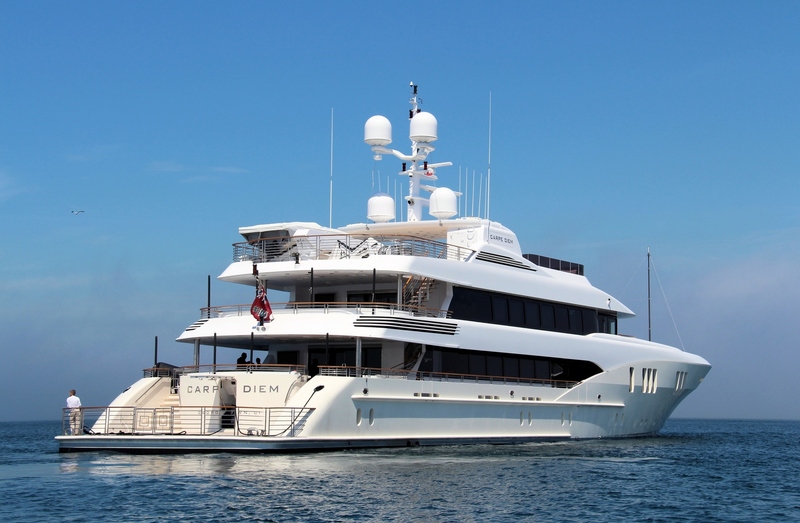 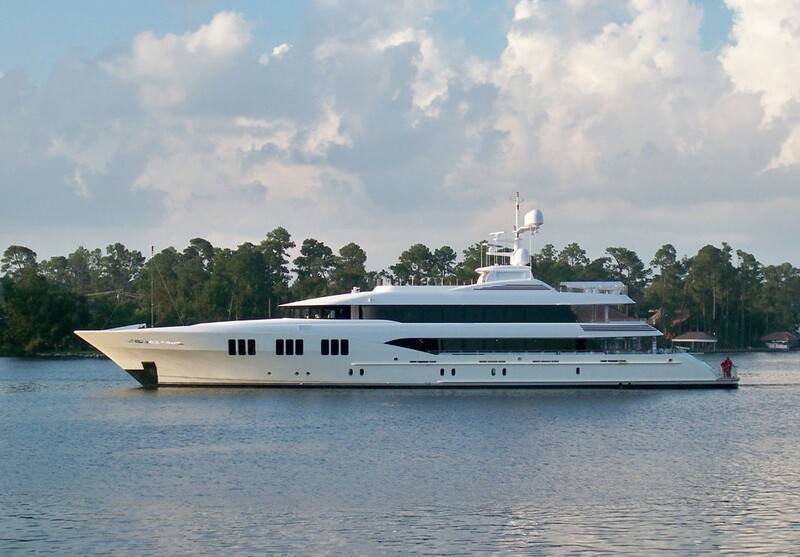 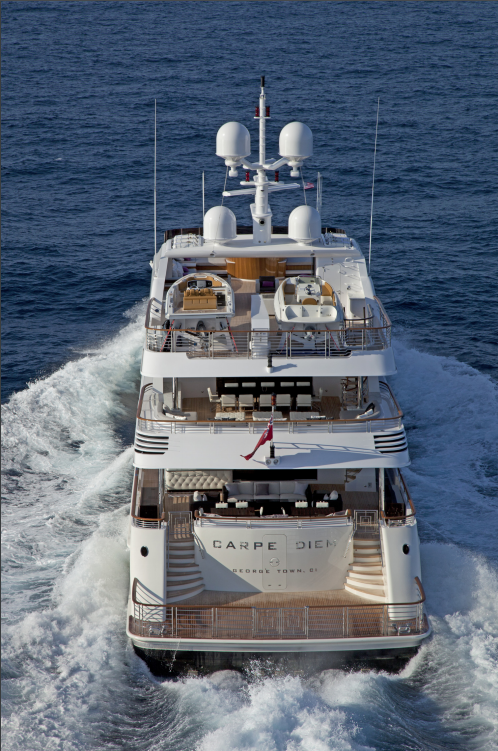 Motor Yacht CARPE DIEM (hull T047) is a 58.23 m (191 ft) long luxury vessel launched from Trinity Yachts shipyard in November 2010. 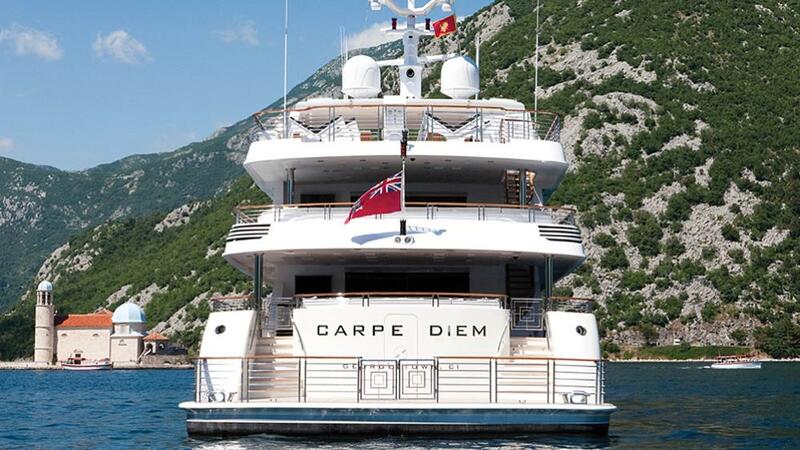 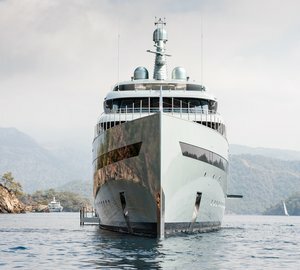 Superyacht CARPE DIEM is a tri-deck all aluminum luxury boat with naval architecture and styling by Trinity Yachts, LLC. 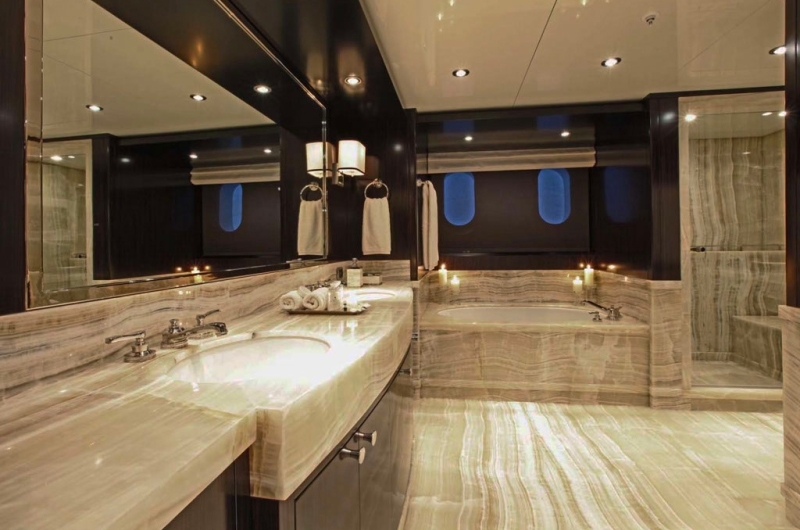 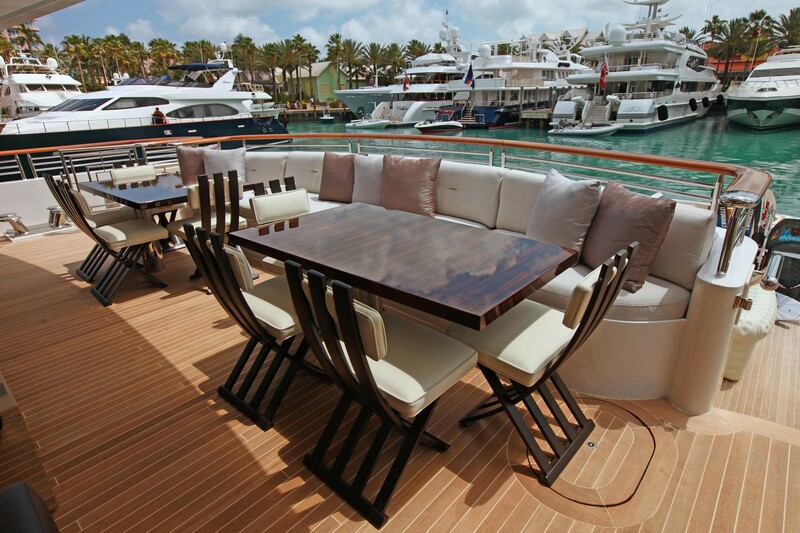 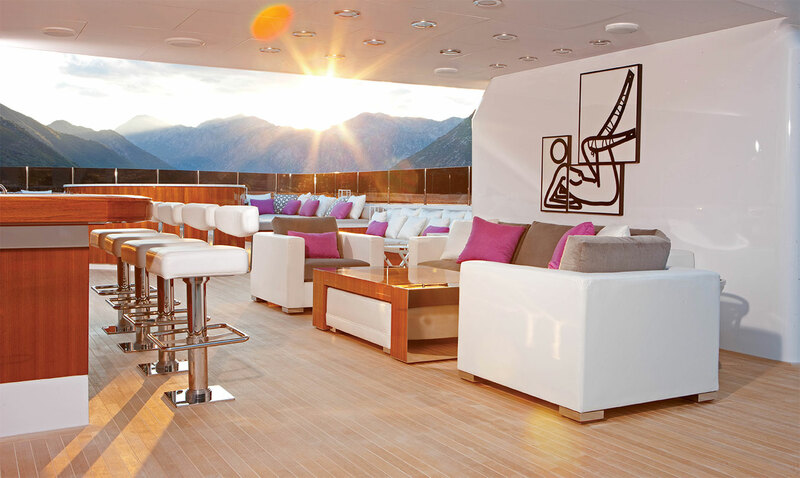 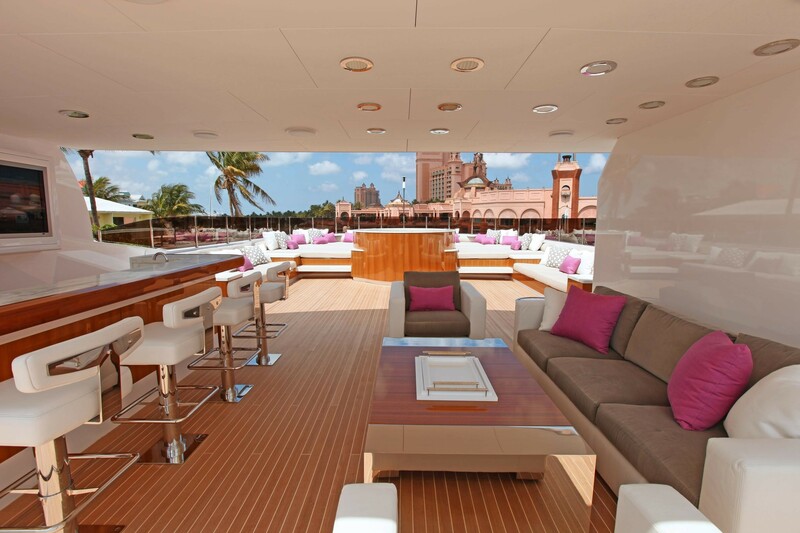 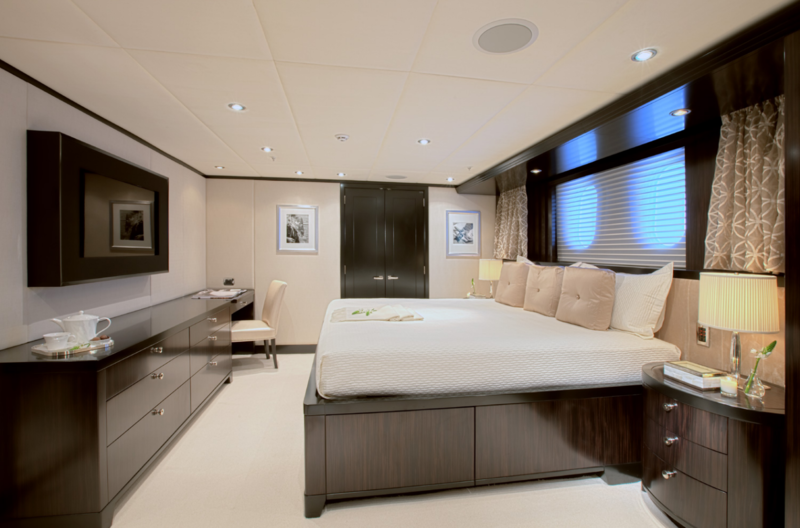 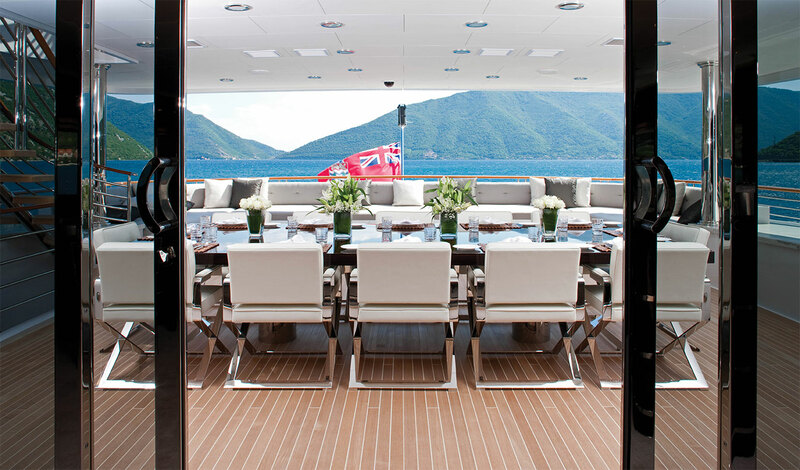 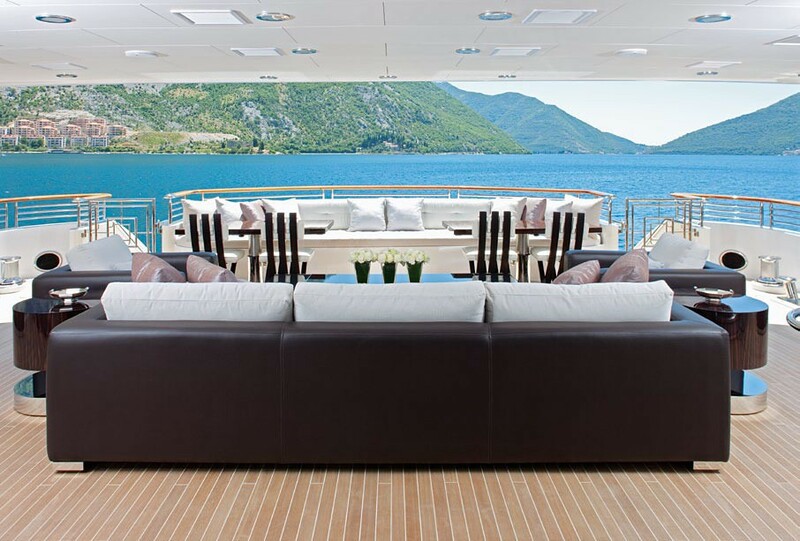 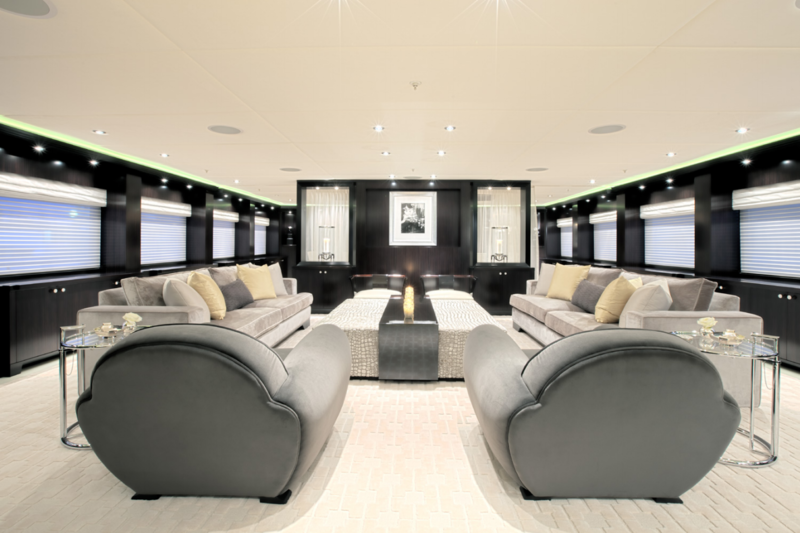 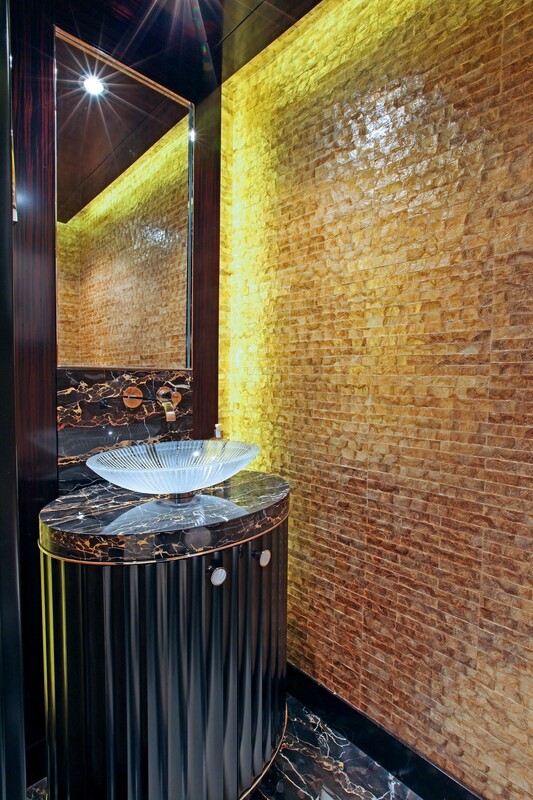 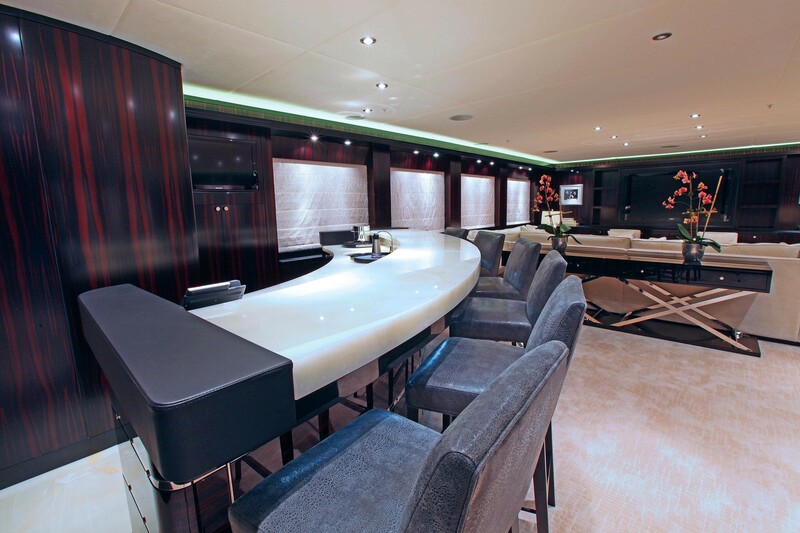 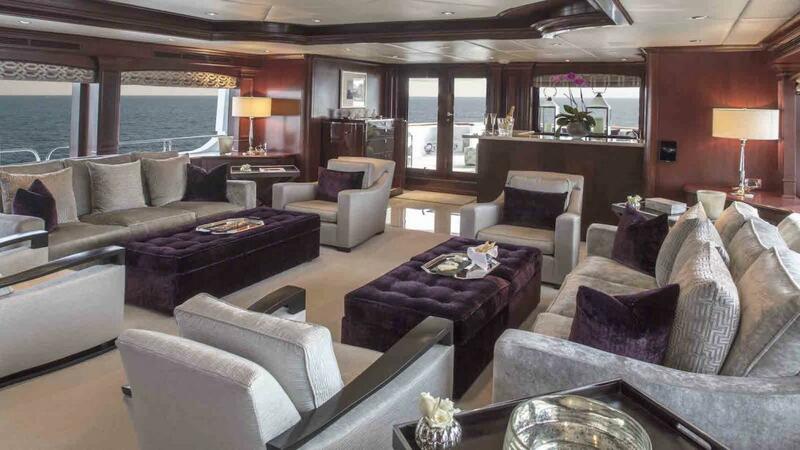 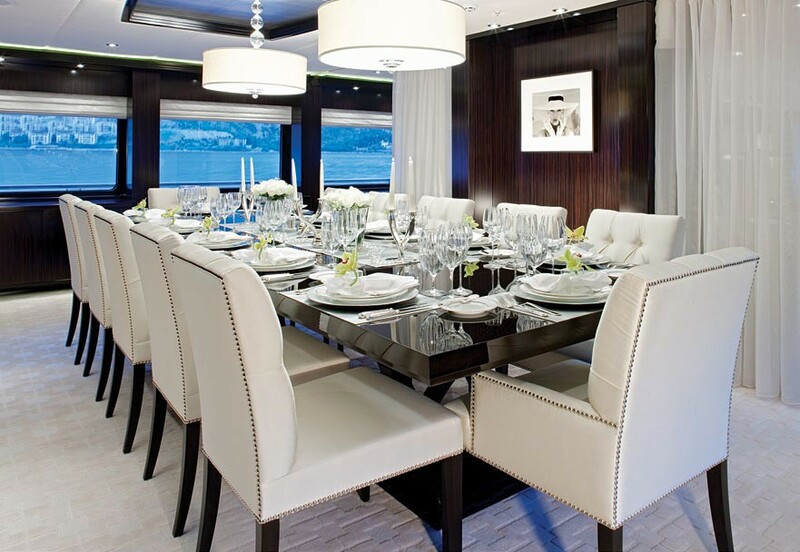 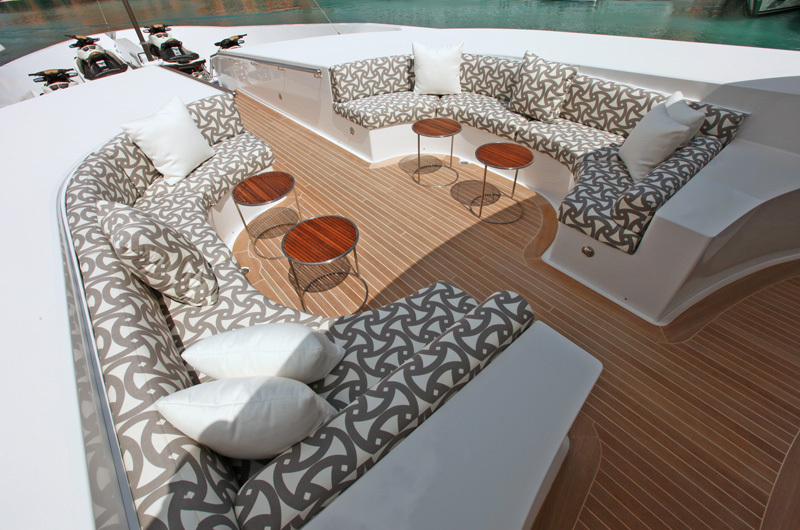 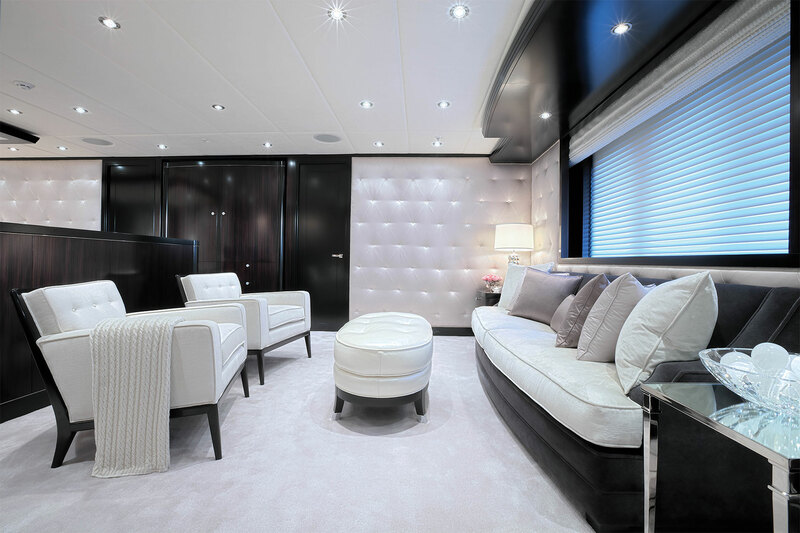 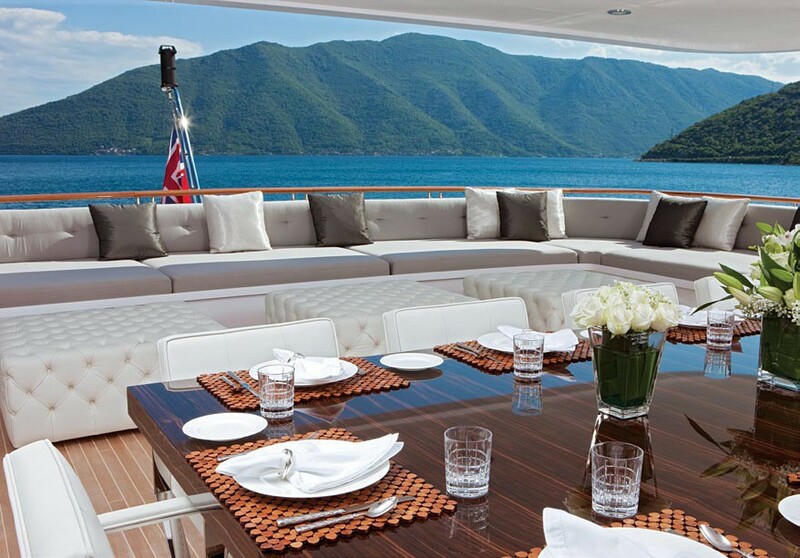 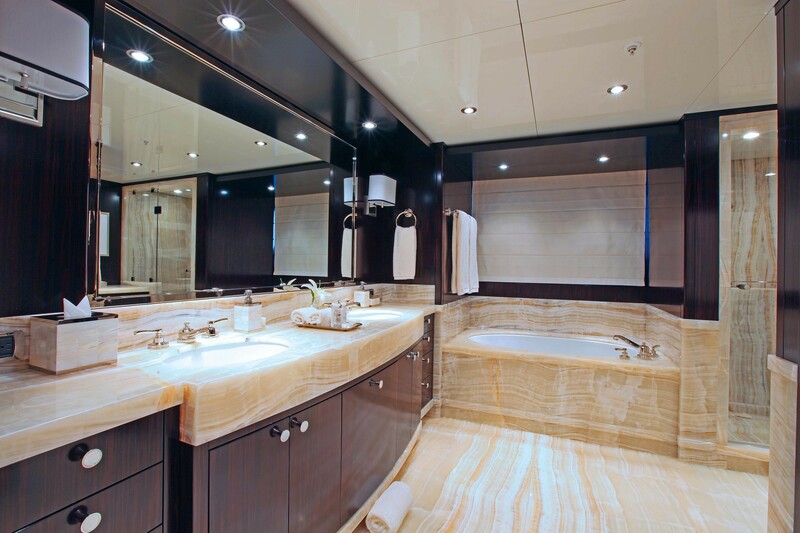 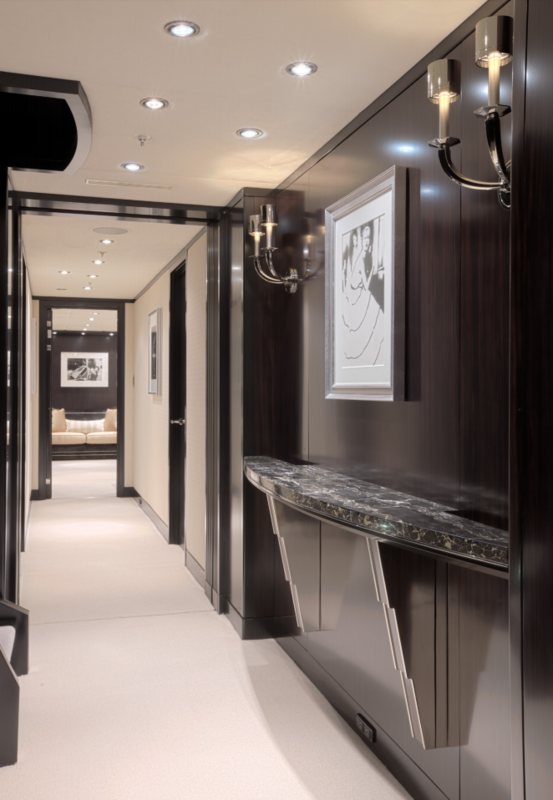 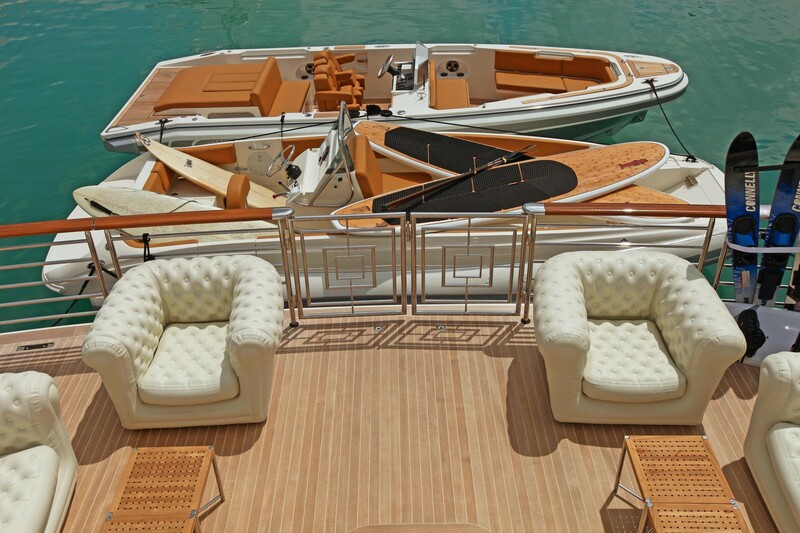 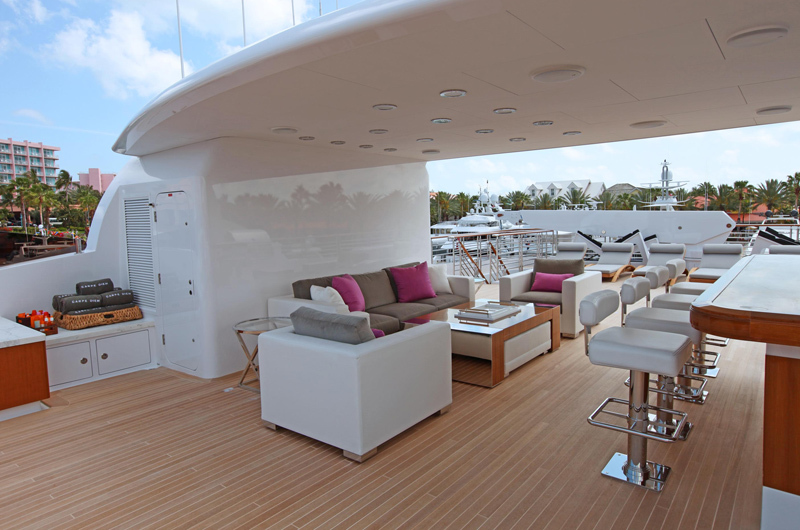 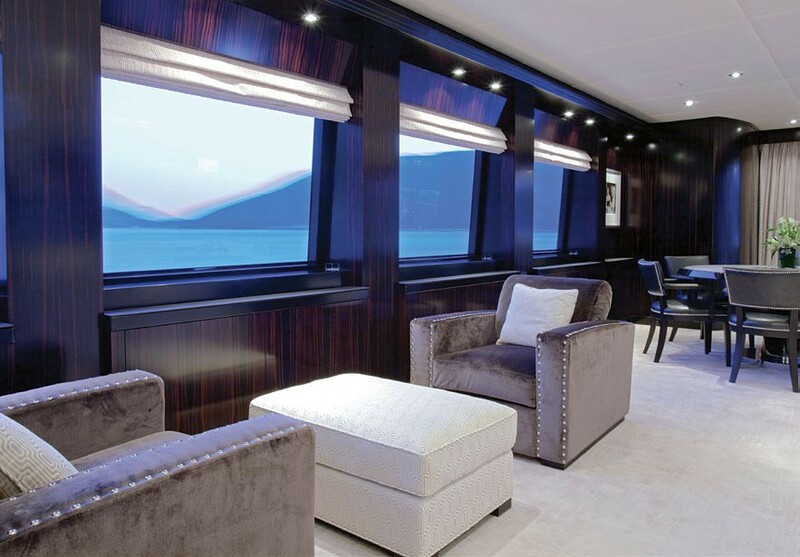 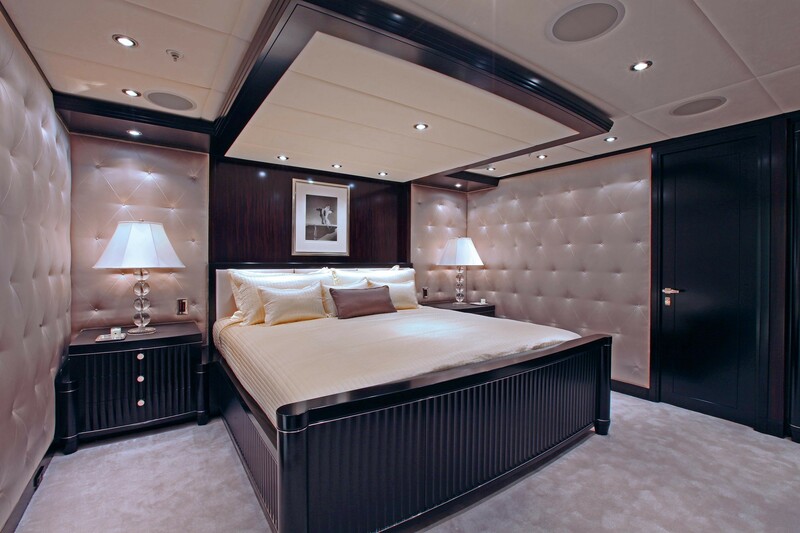 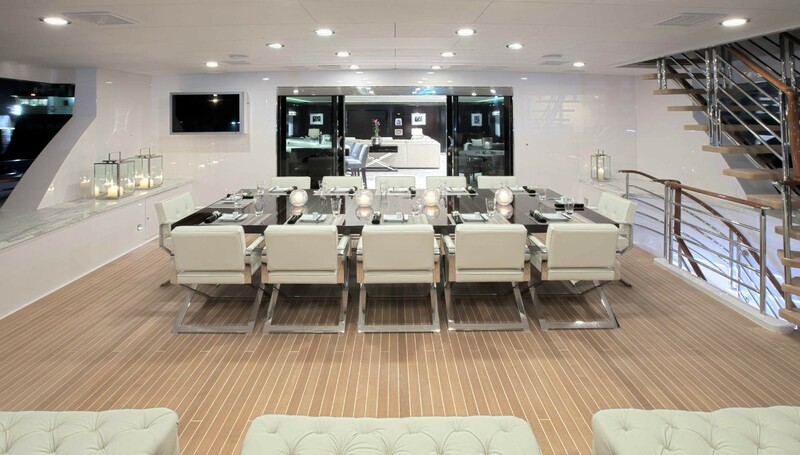 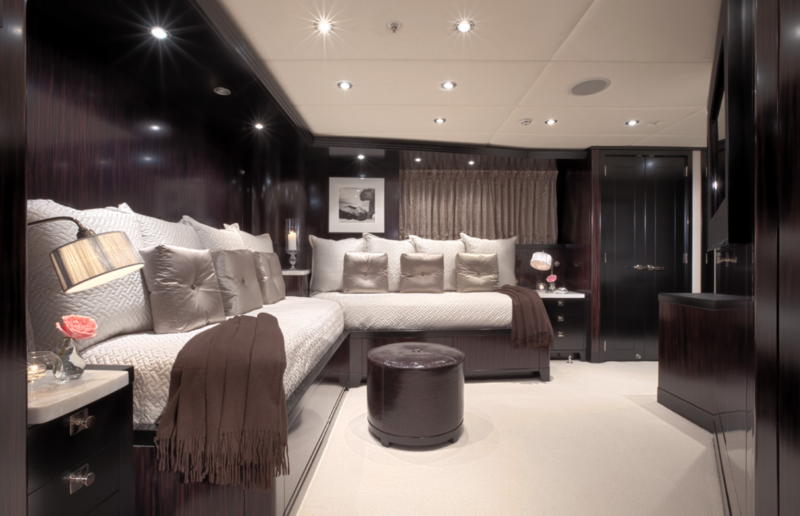 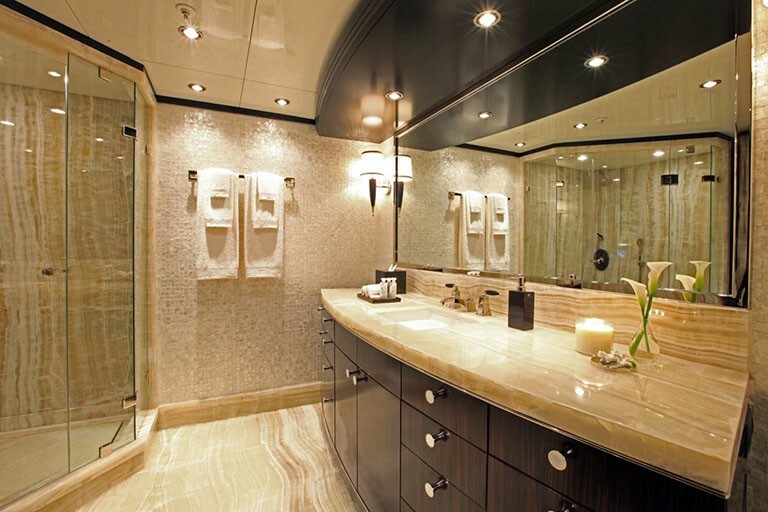 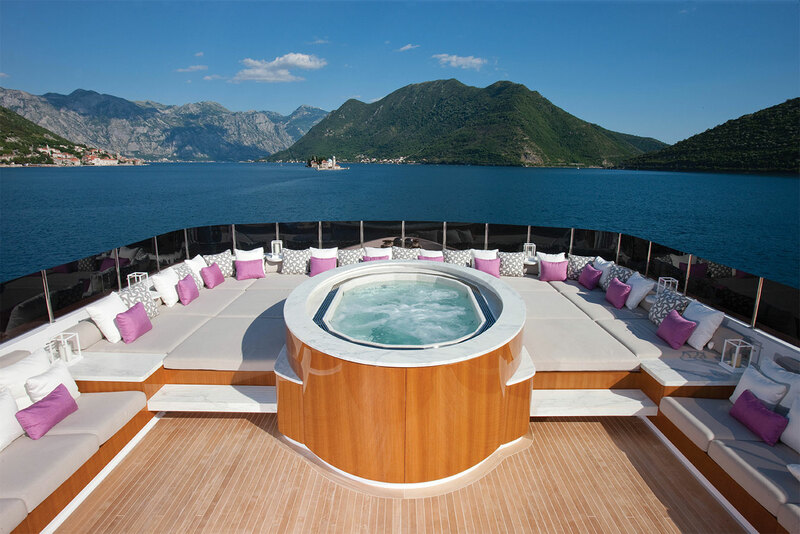 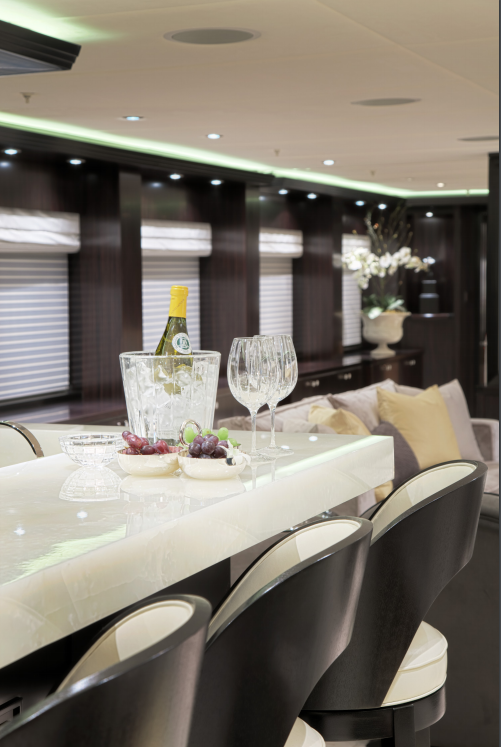 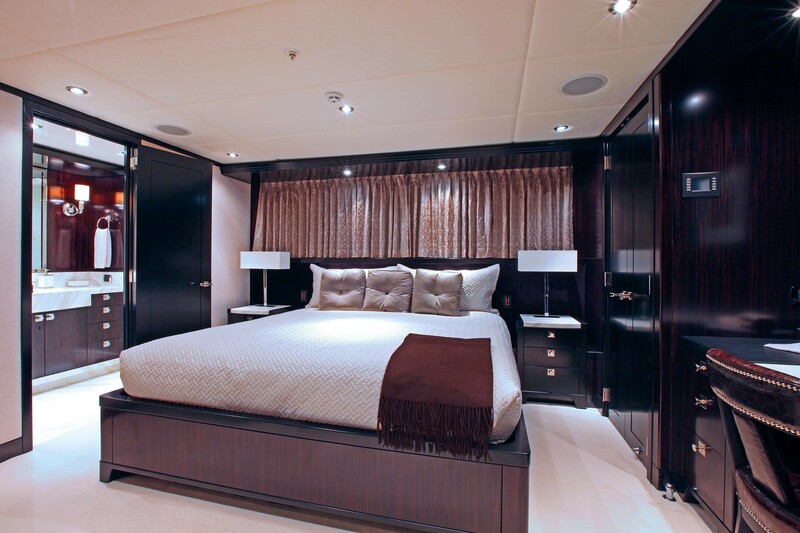 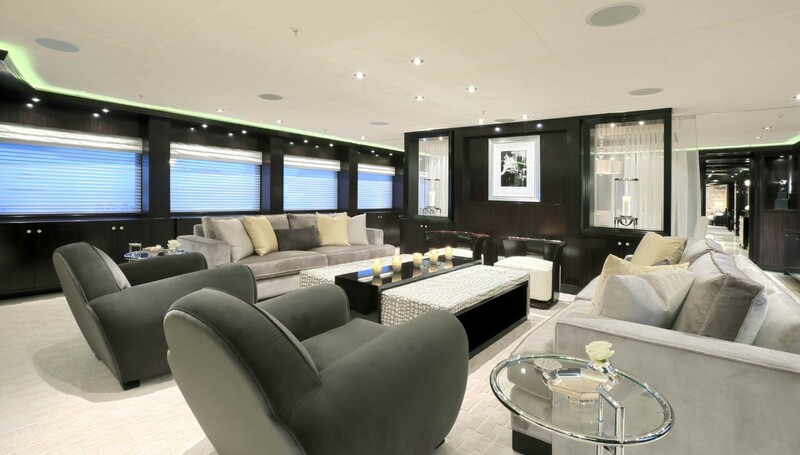 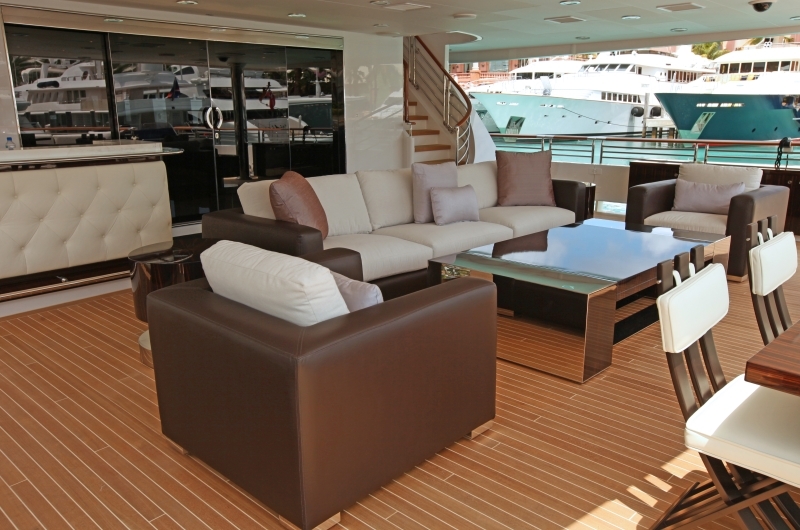 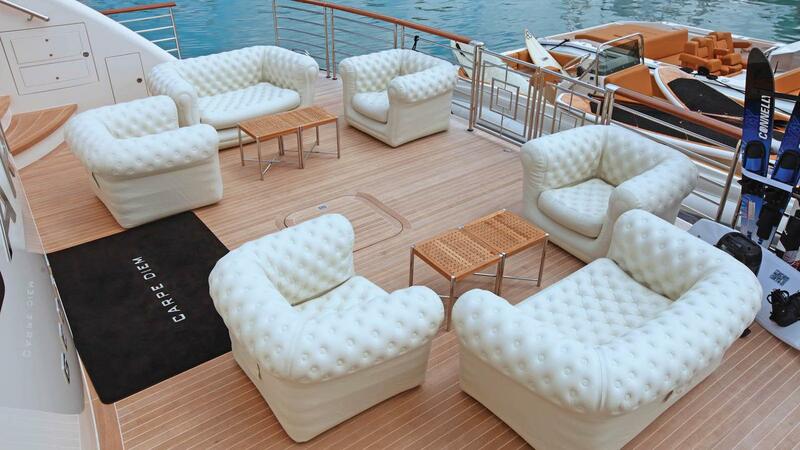 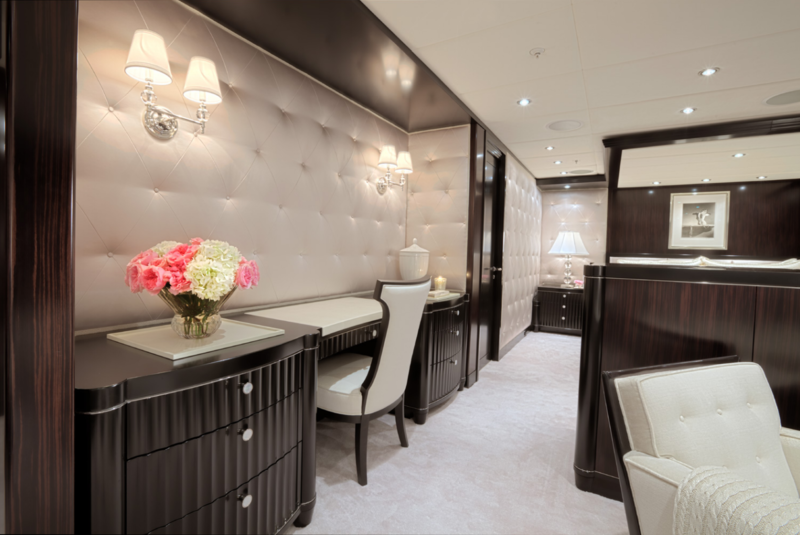 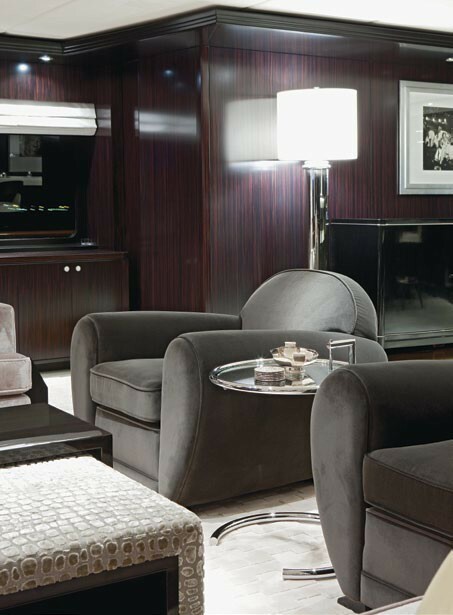 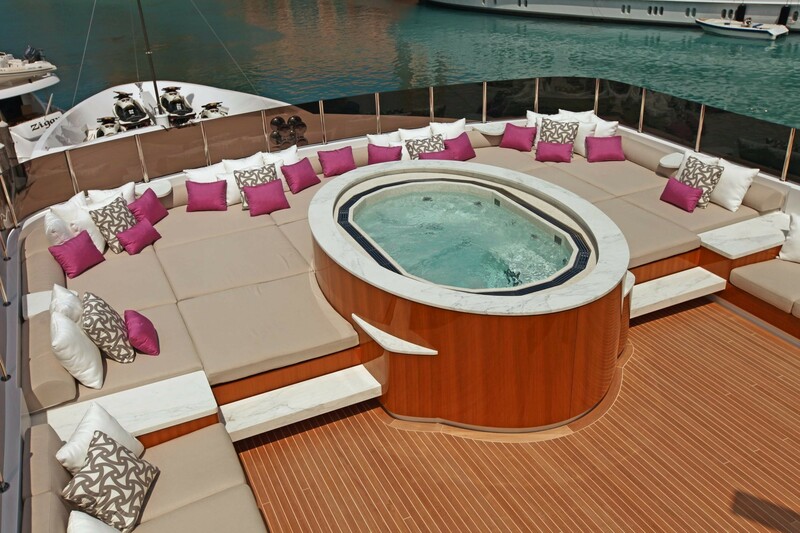 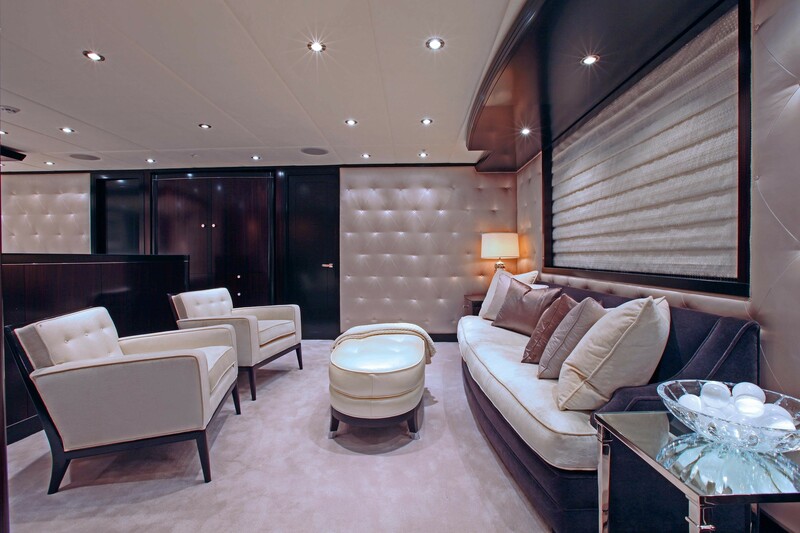 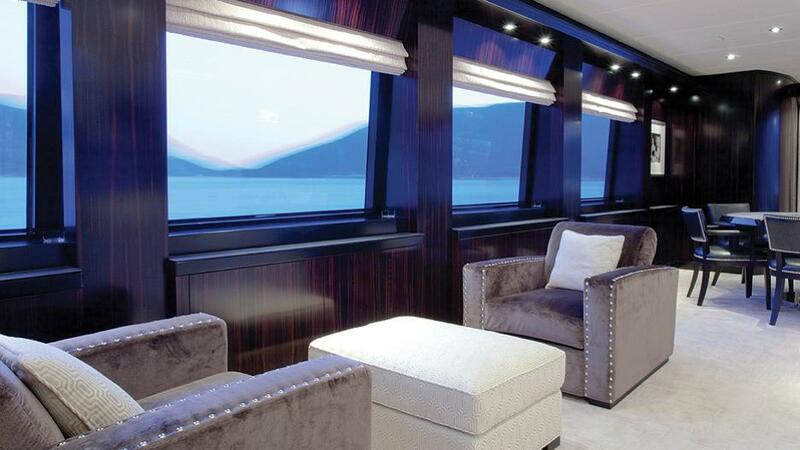 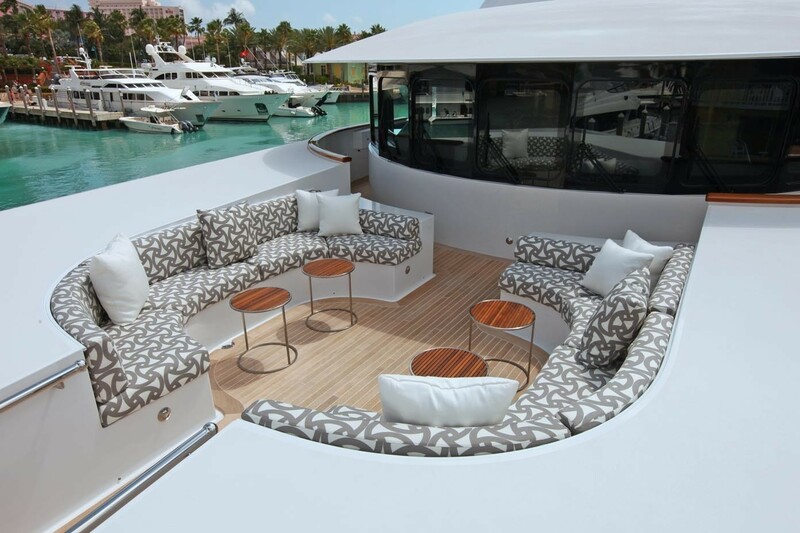 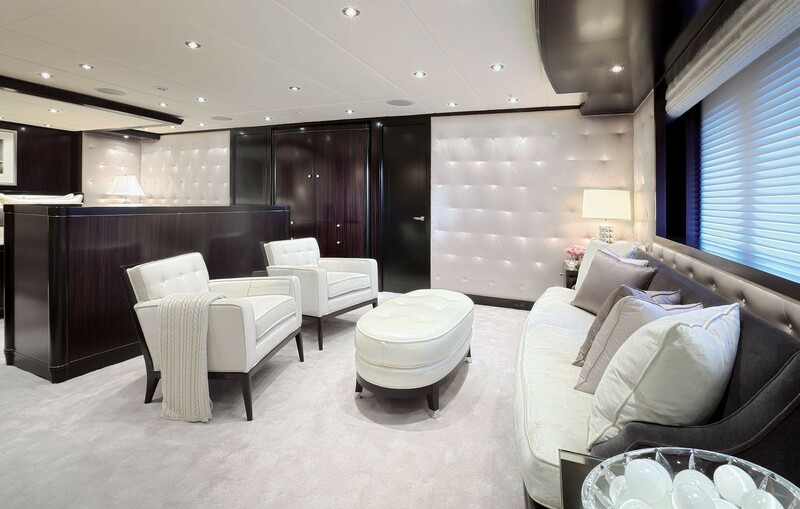 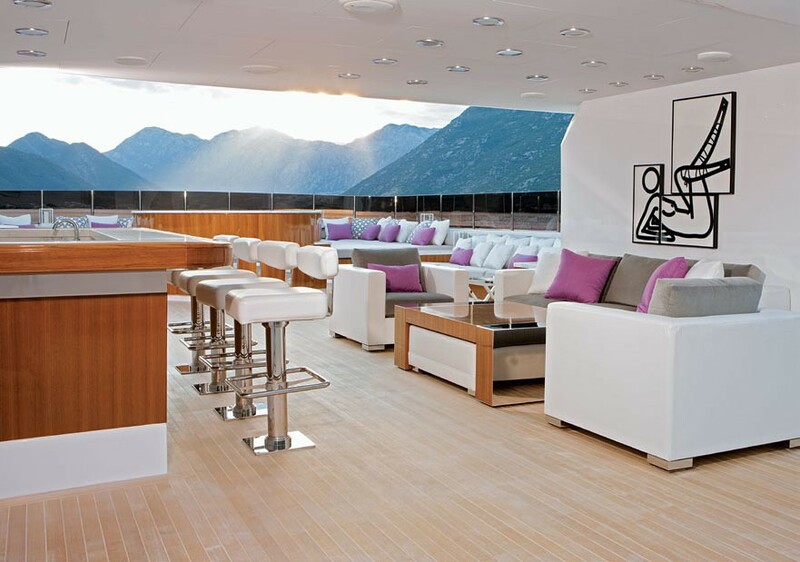 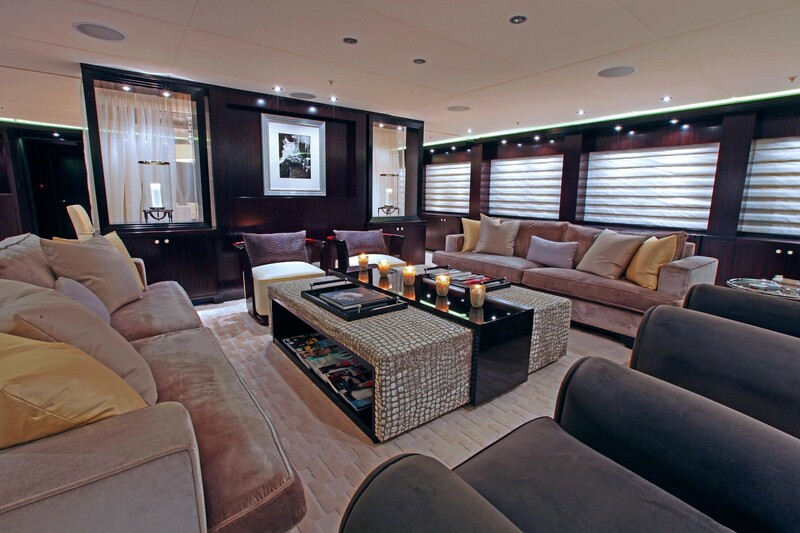 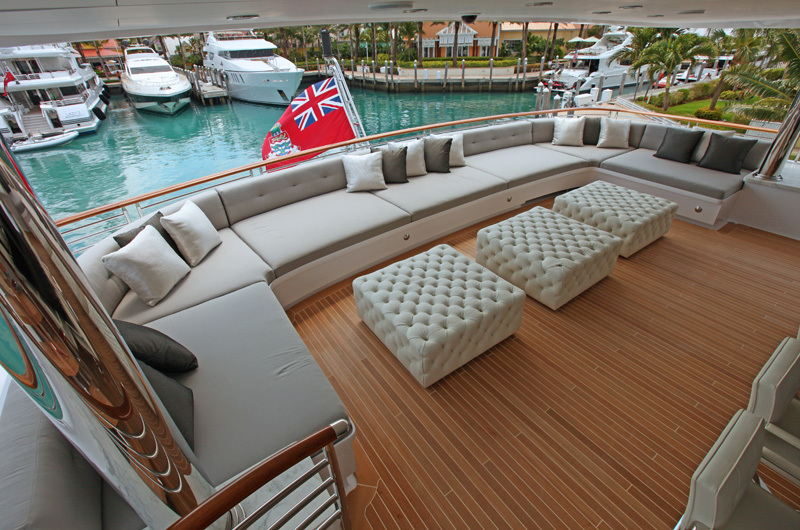 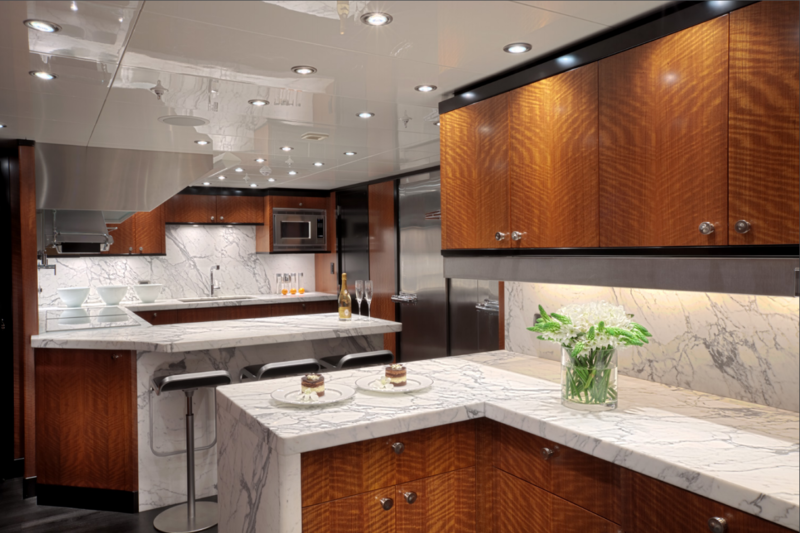 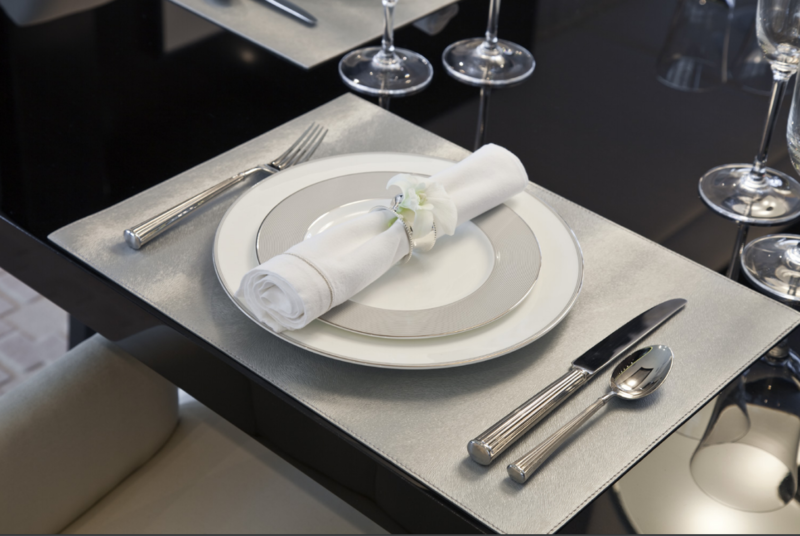 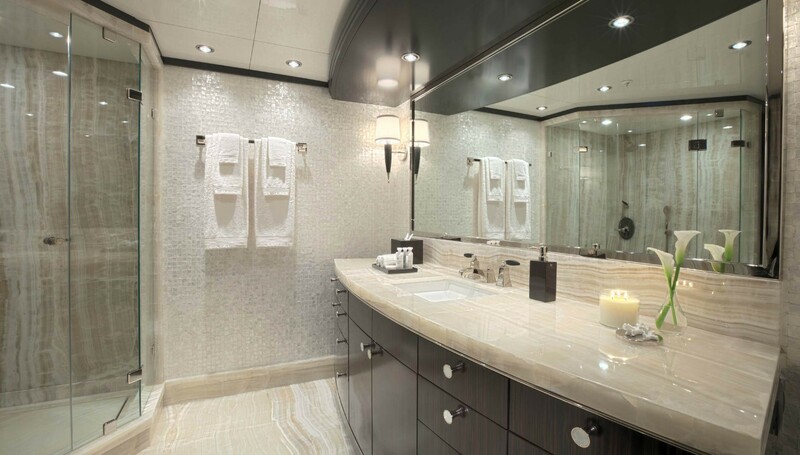 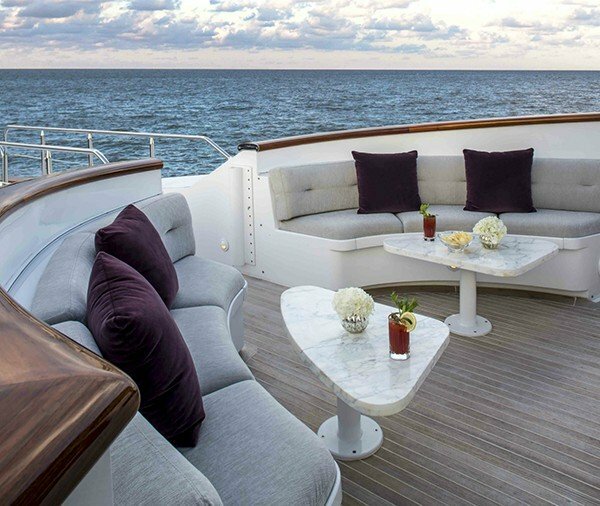 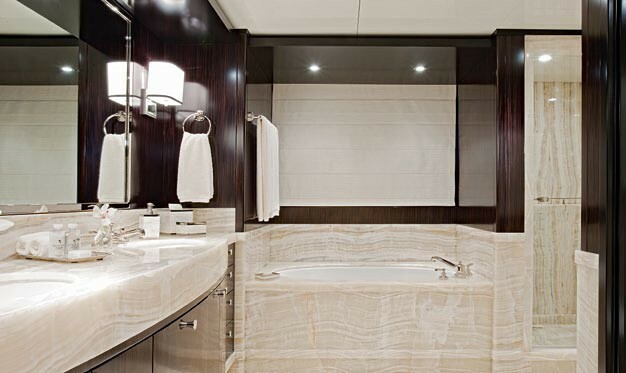 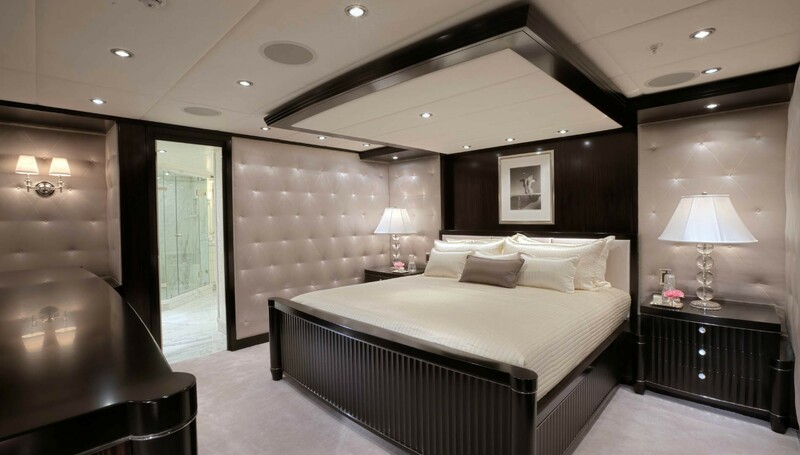 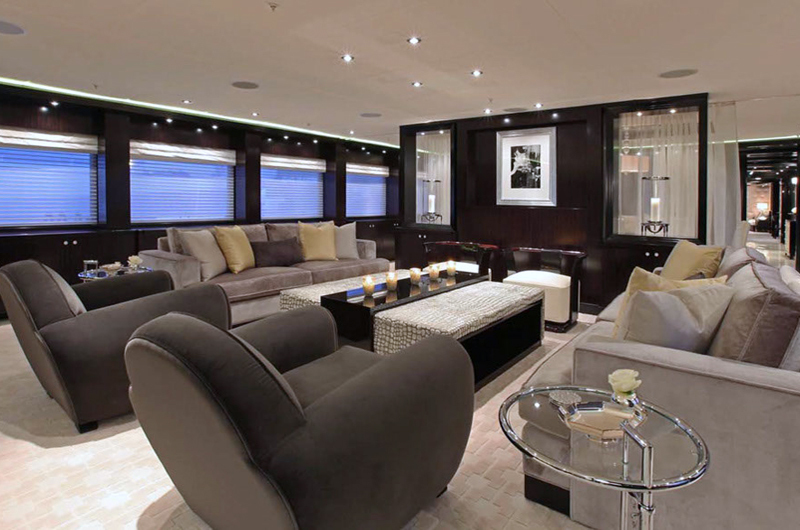 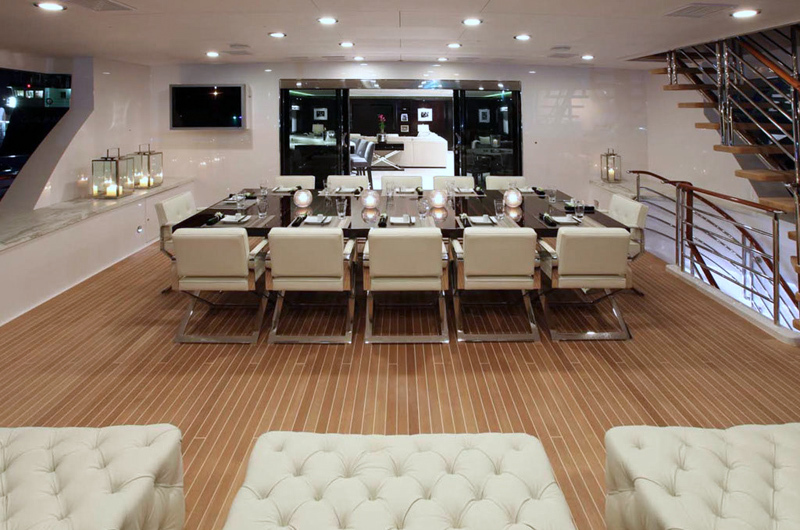 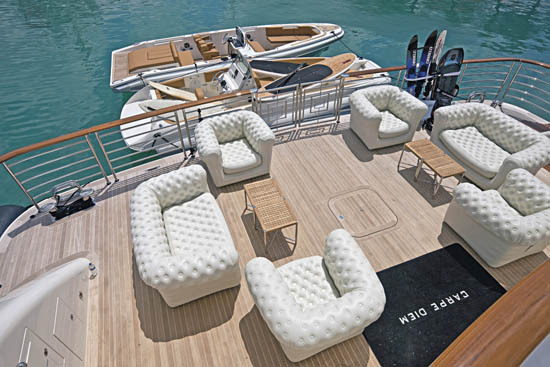 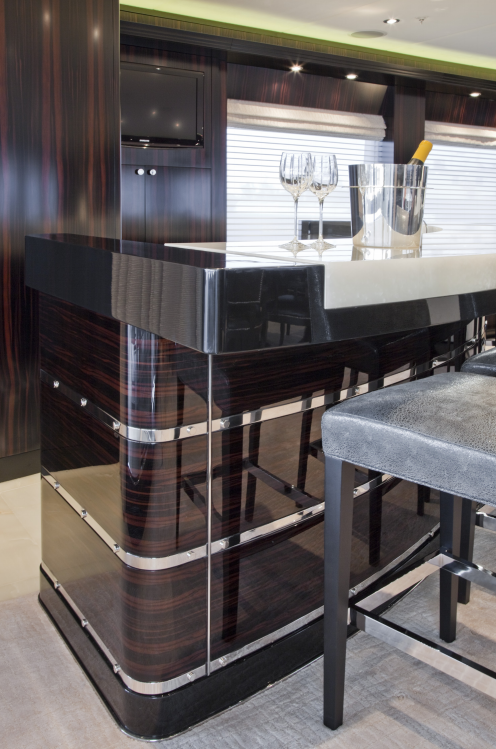 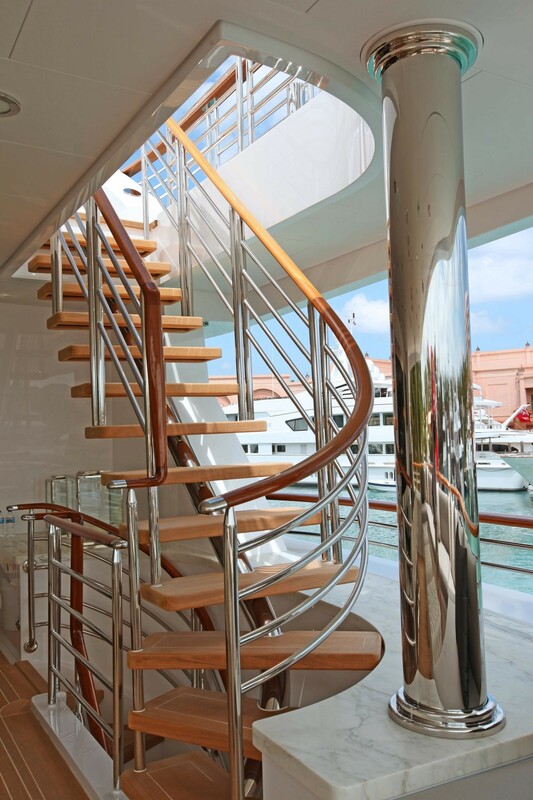 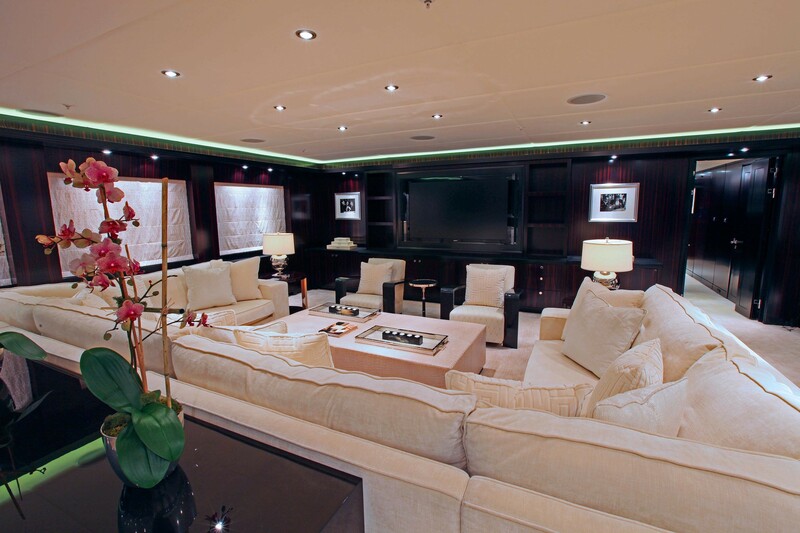 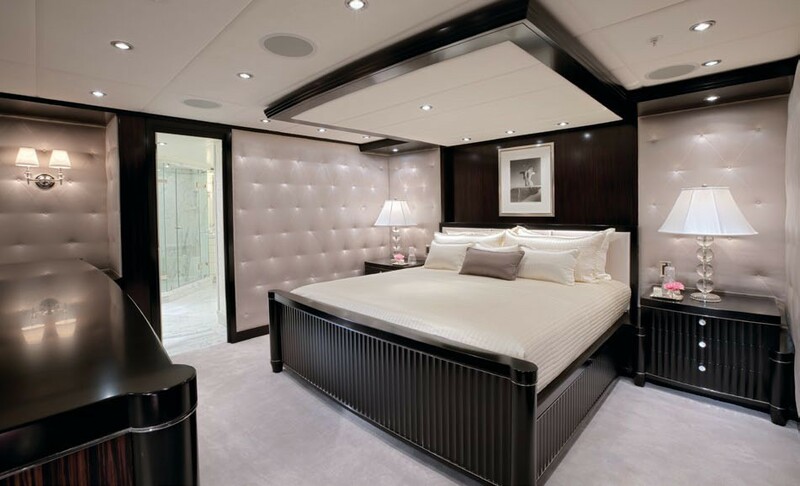 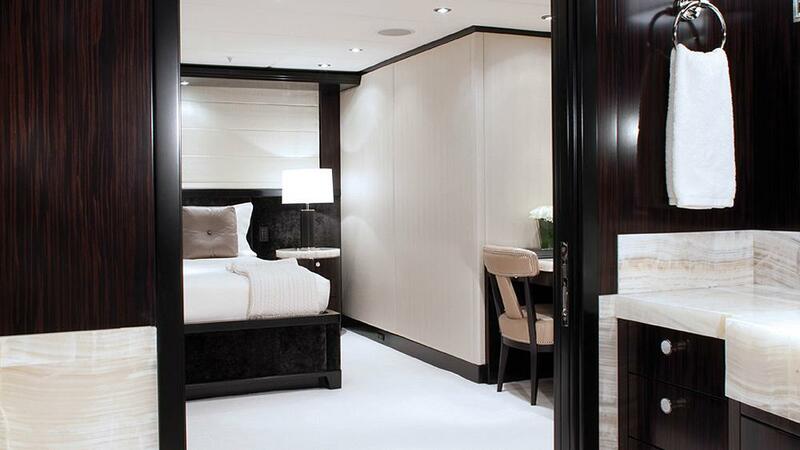 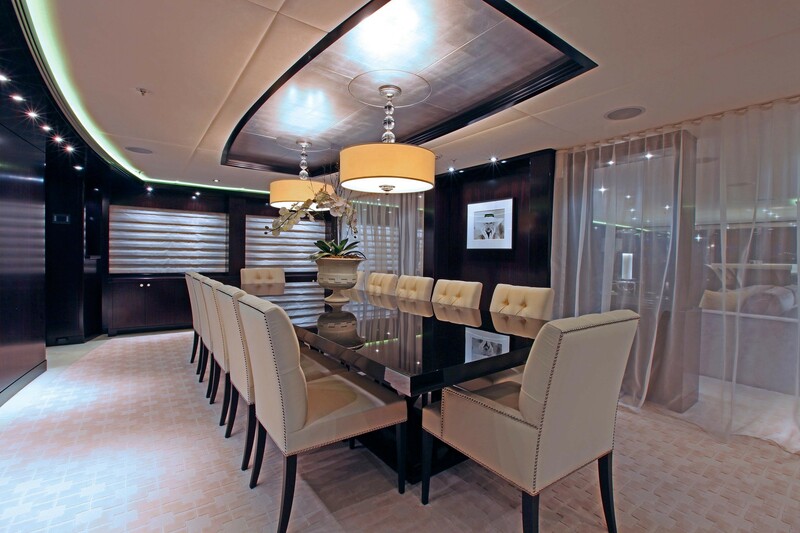 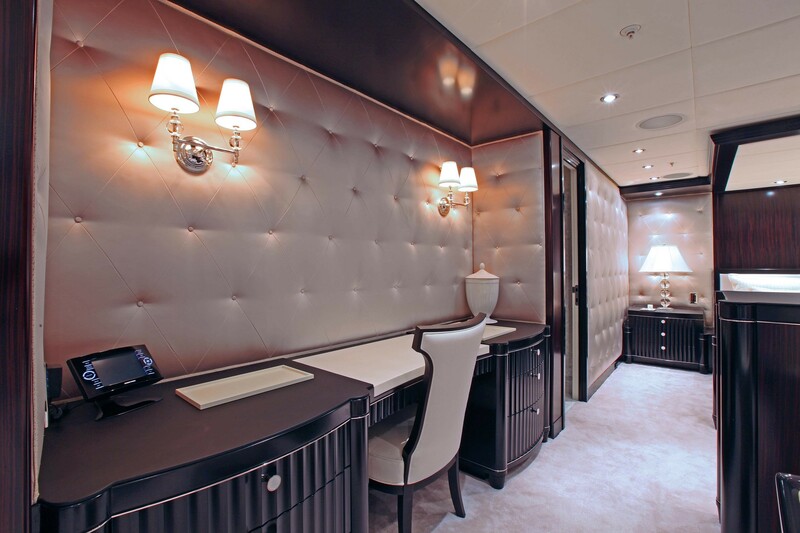 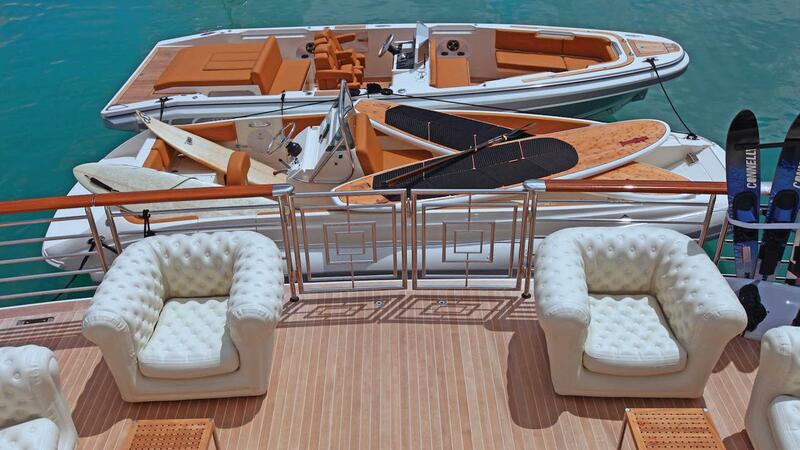 The interior design of the yacht was created by Carol Williamson & Assoc. 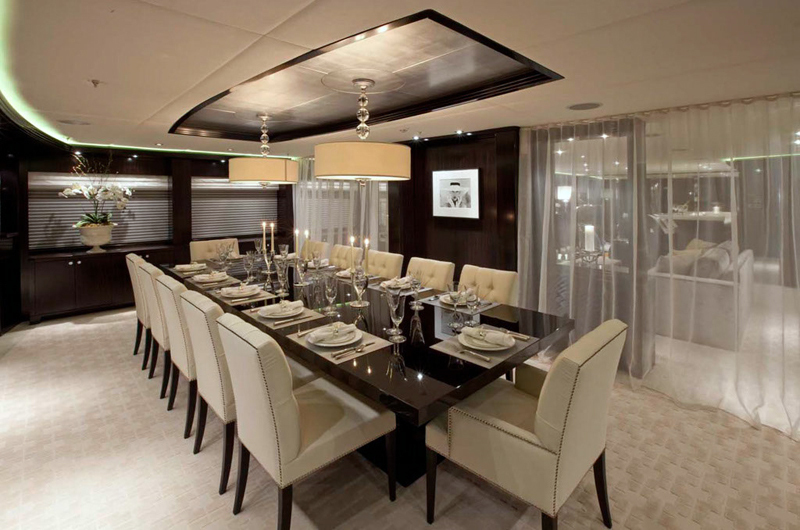 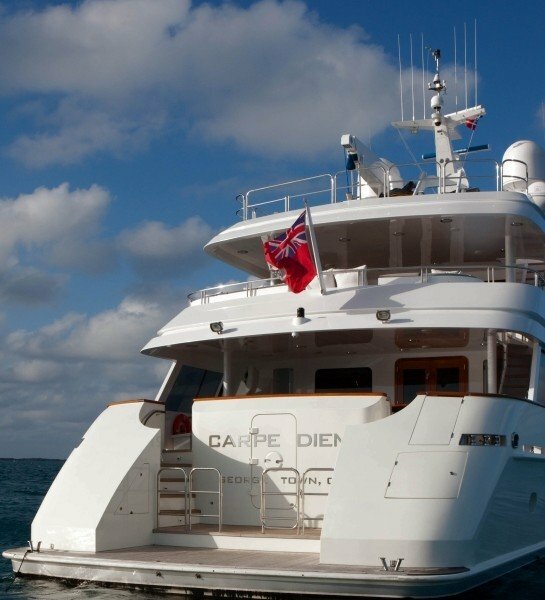 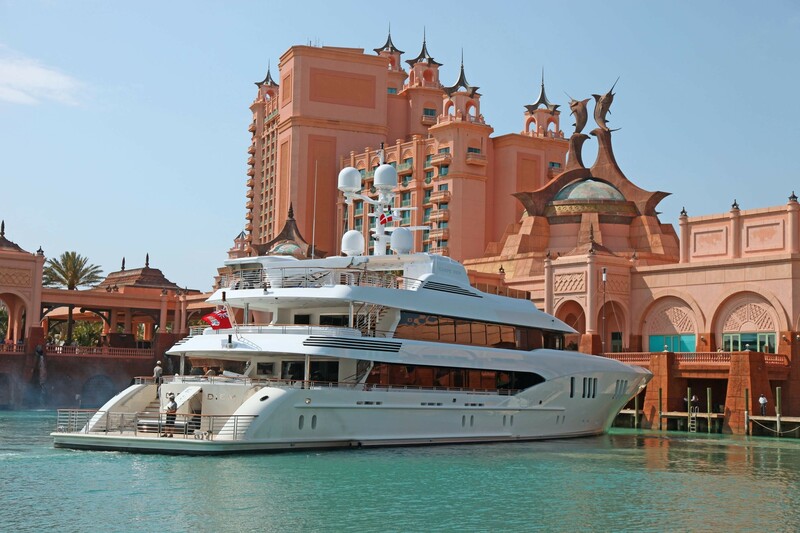 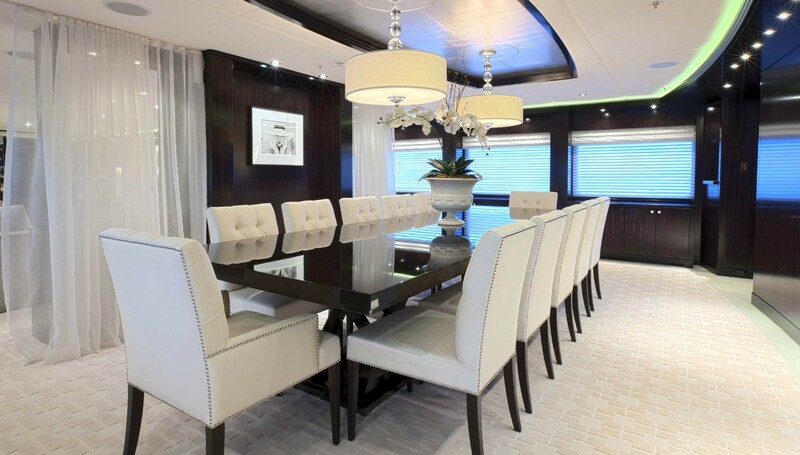 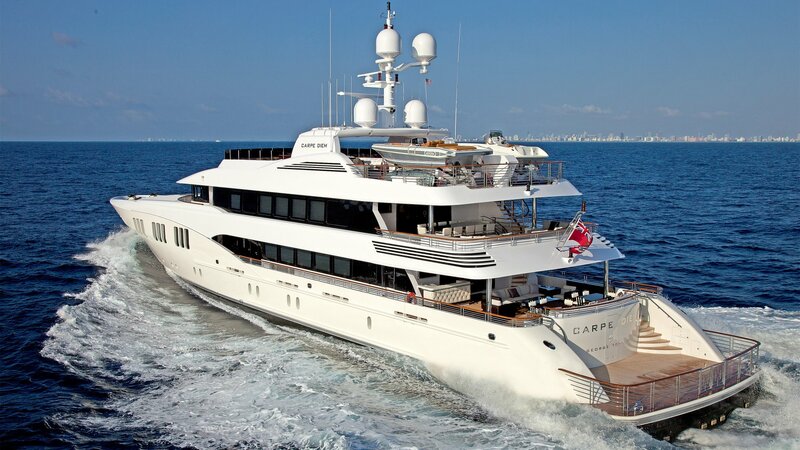 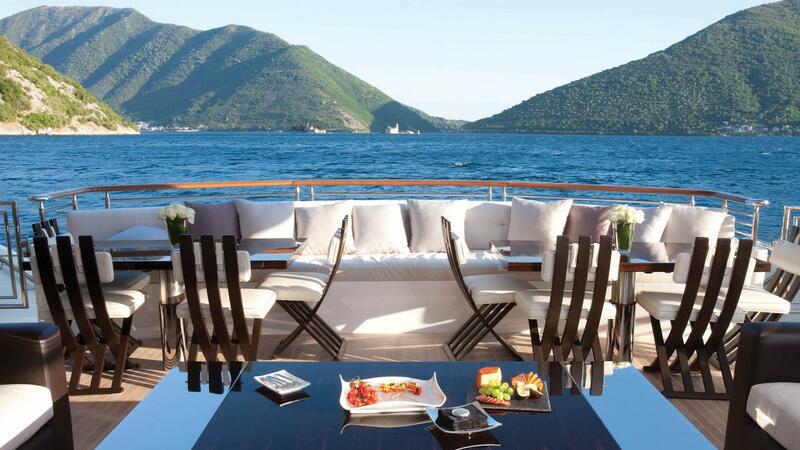 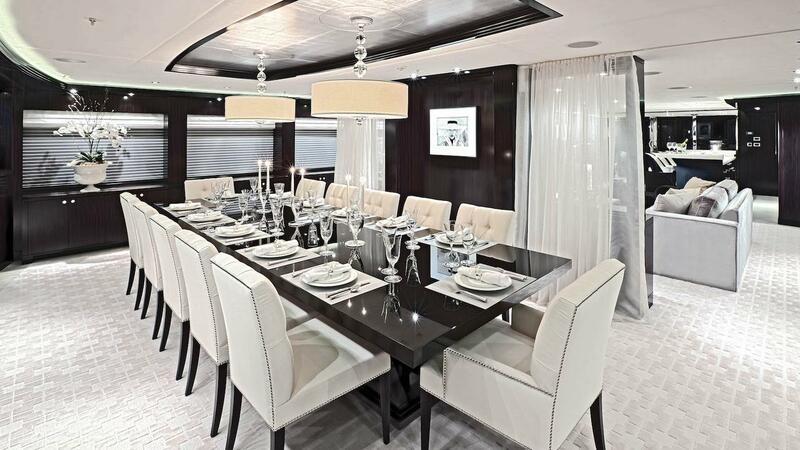 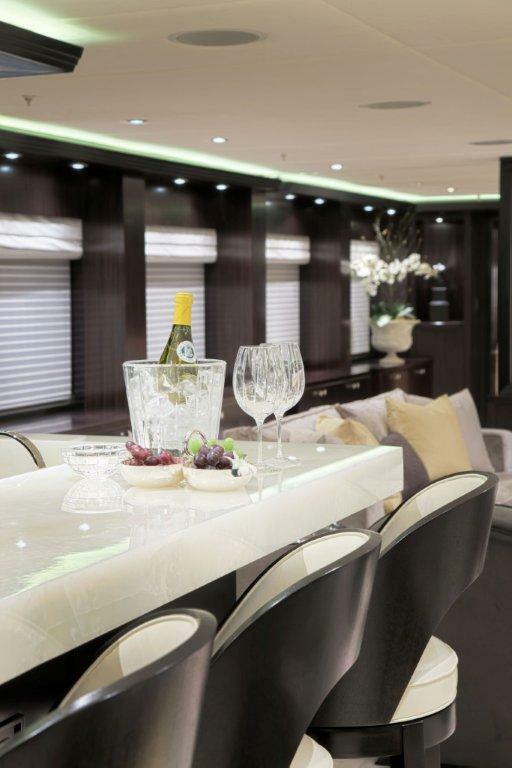 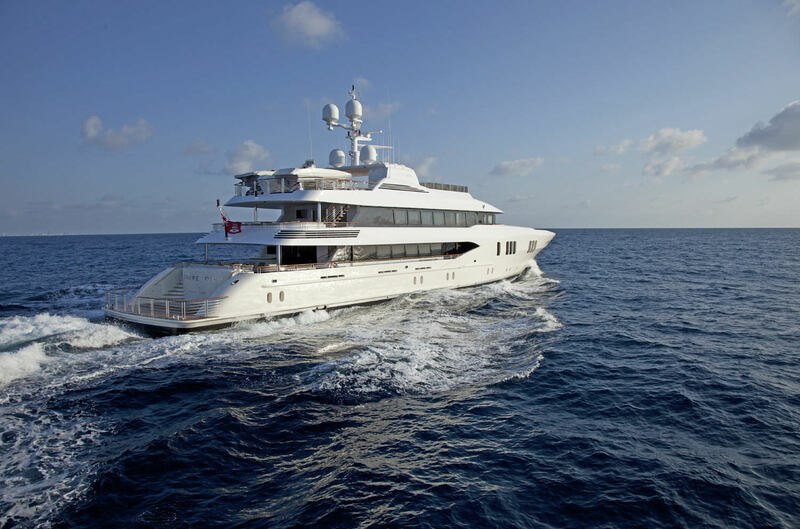 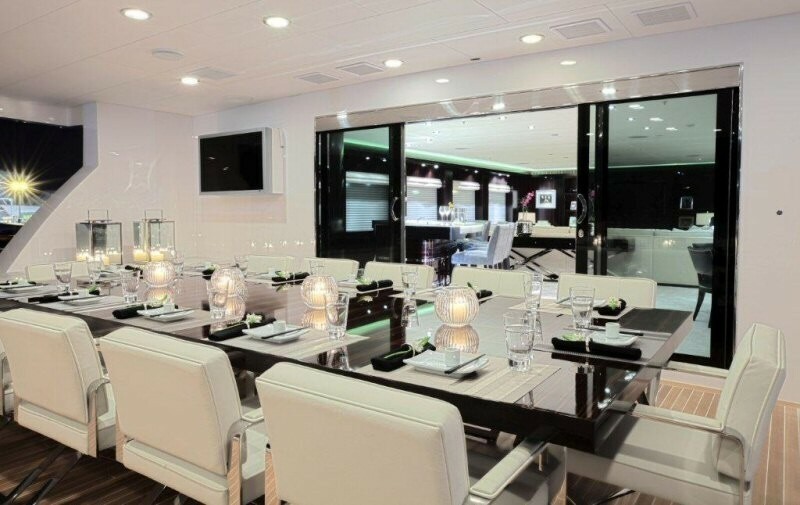 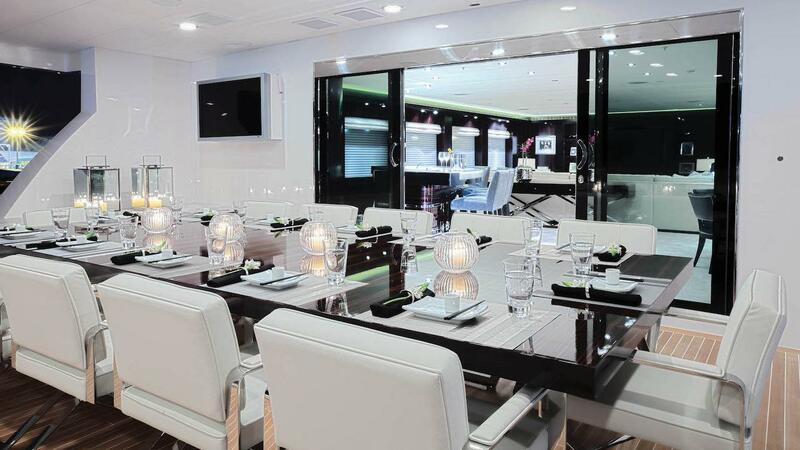 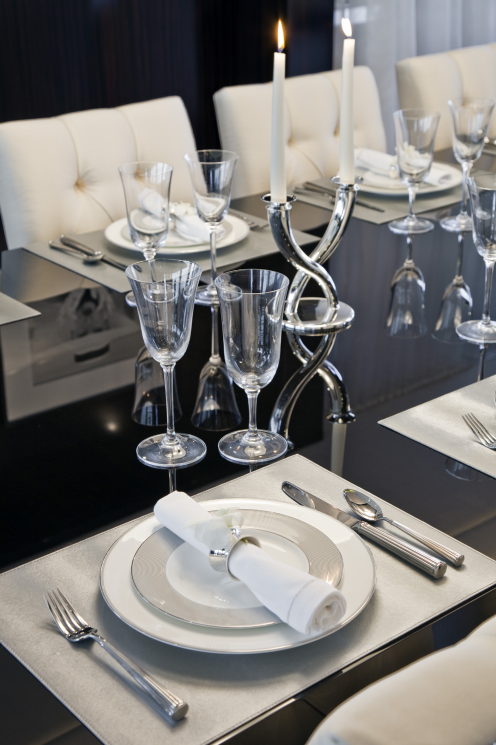 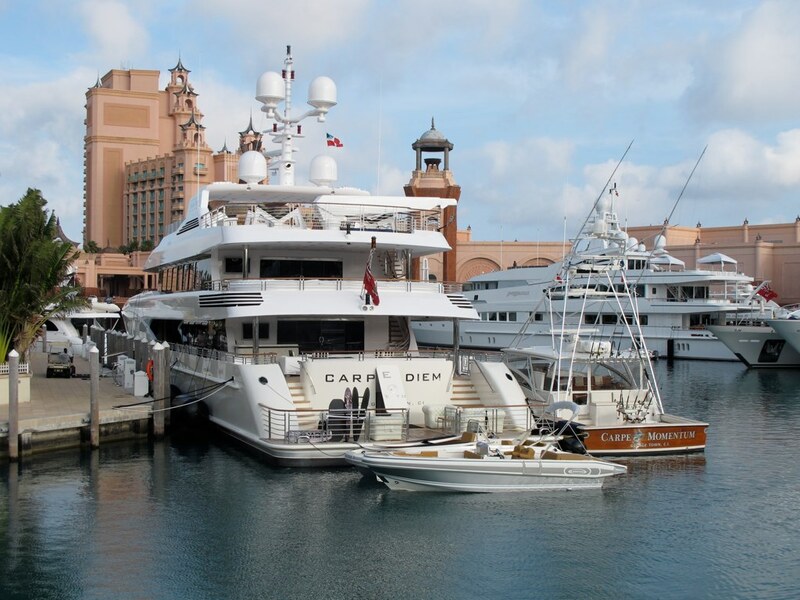 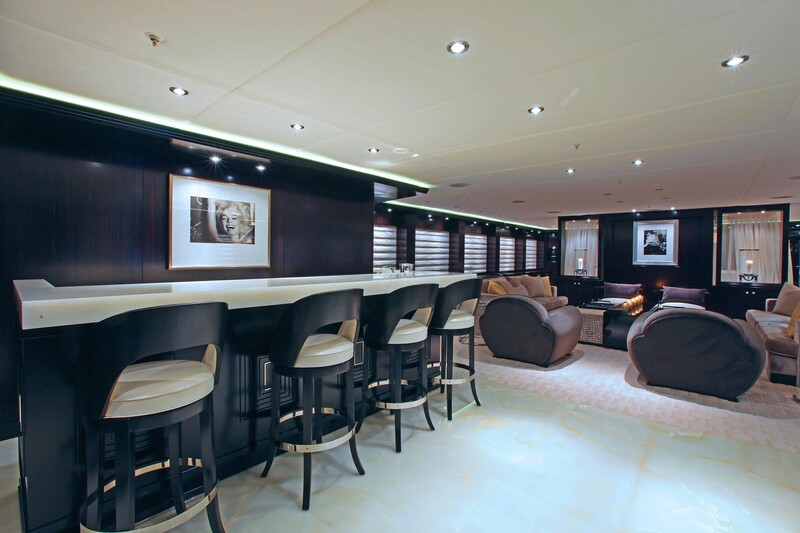 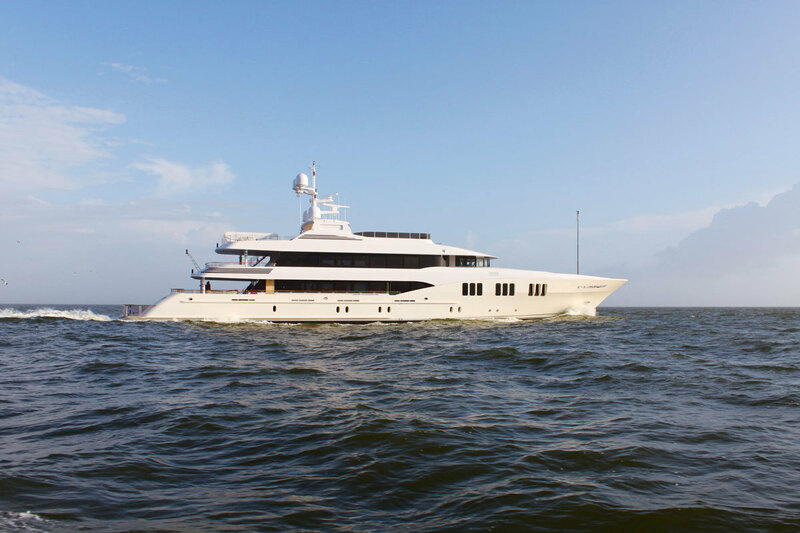 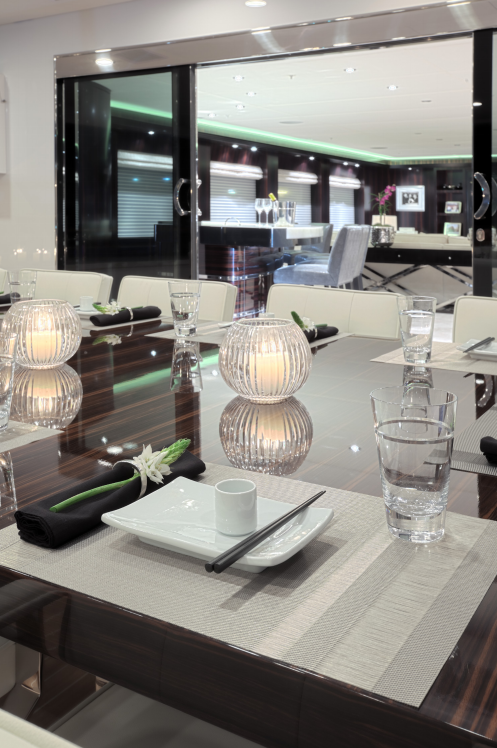 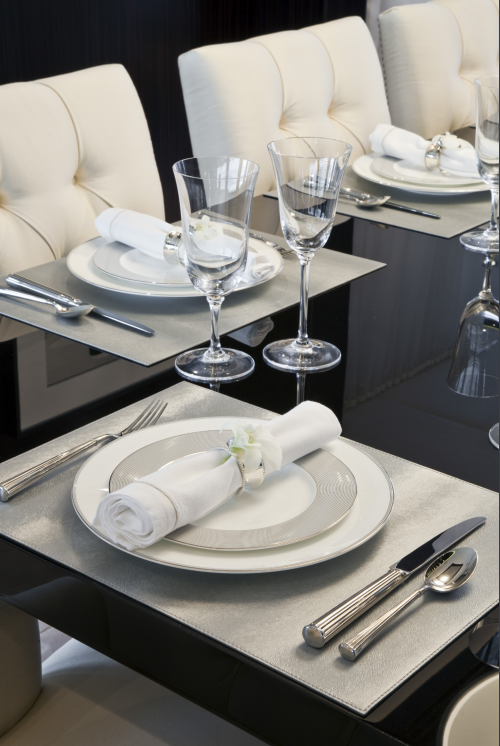 CARPE DIEM features large salon with a bar located aft and a separate dining room forward. 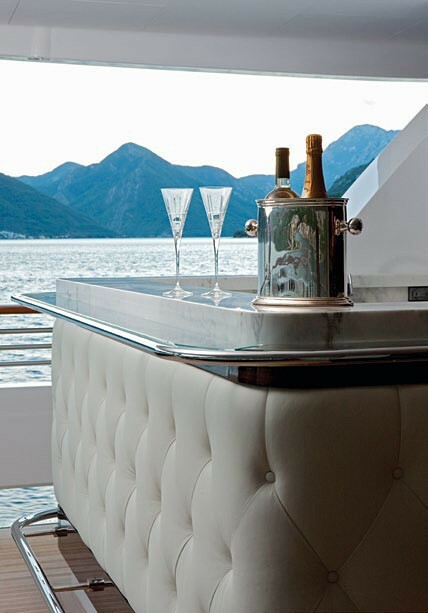 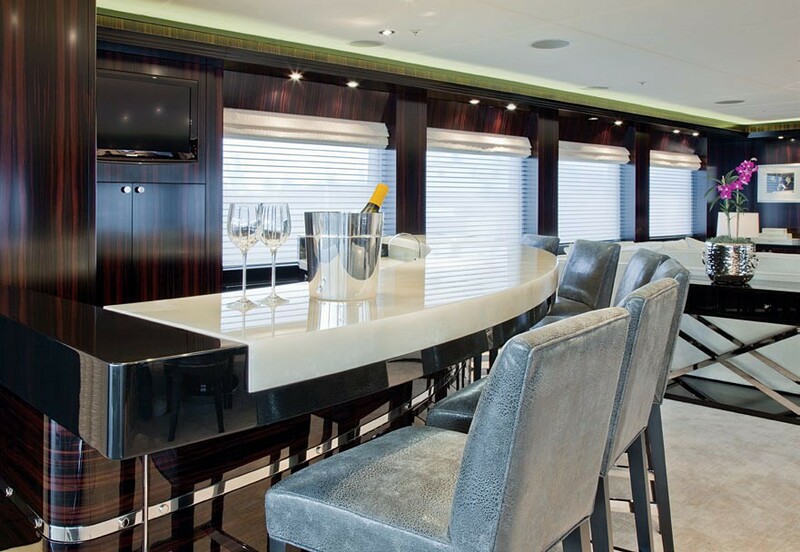 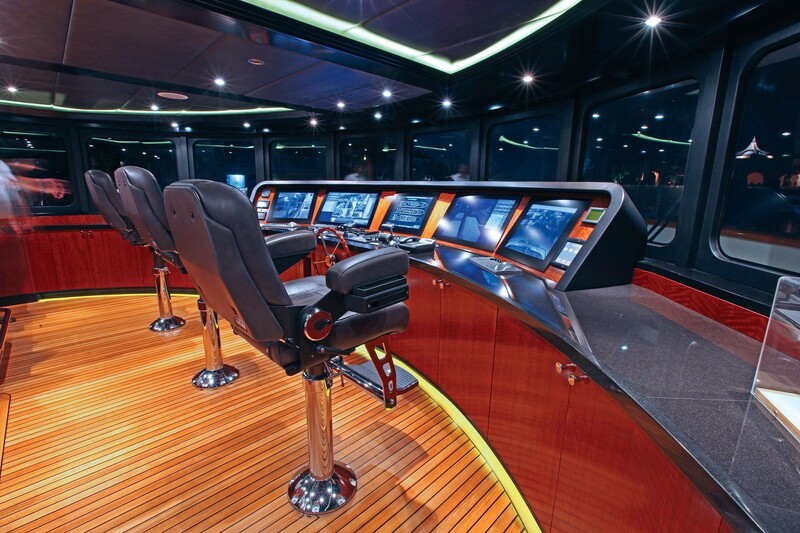 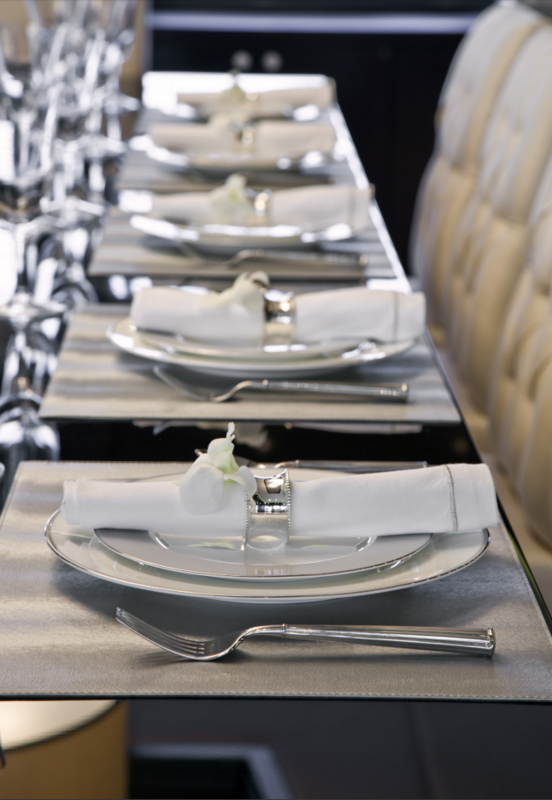 Situated also on the main deck is the galley, with a bar and stools for guests to watch or interact with the chef. 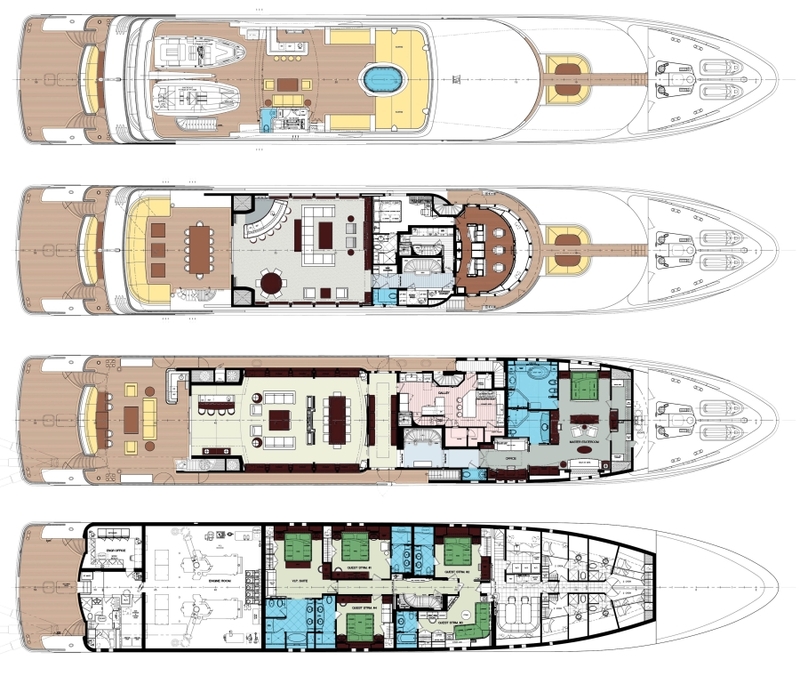 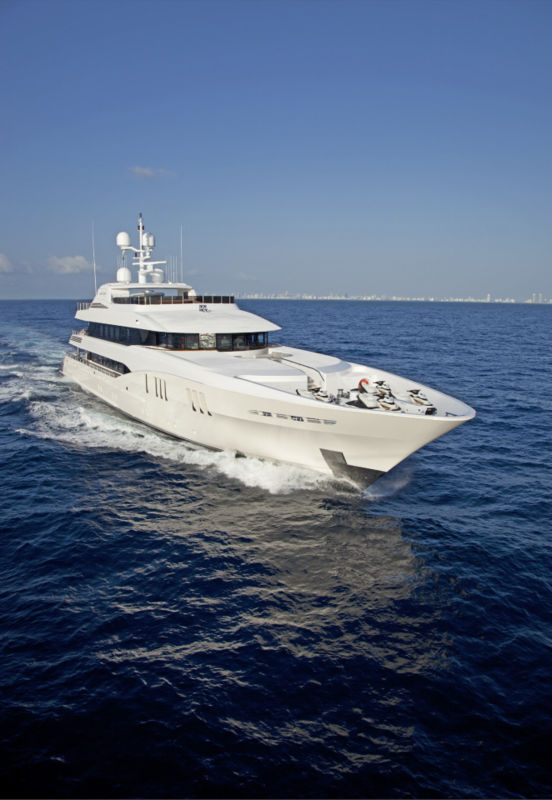 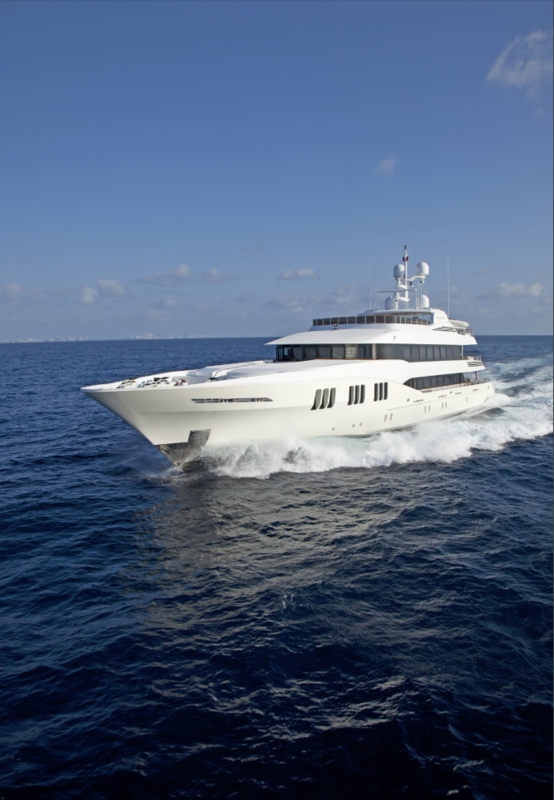 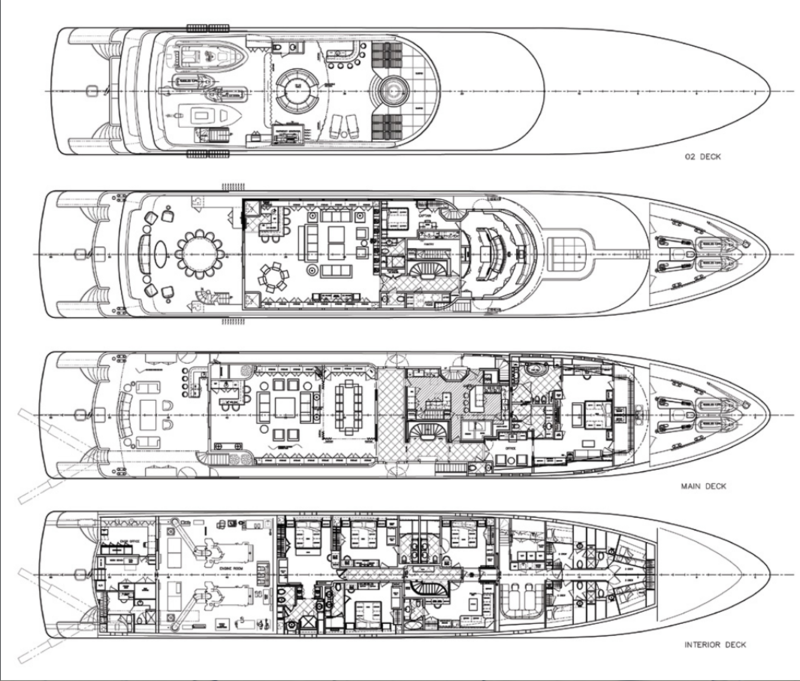 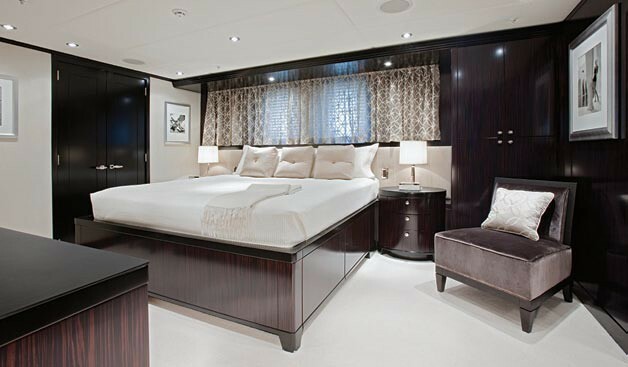 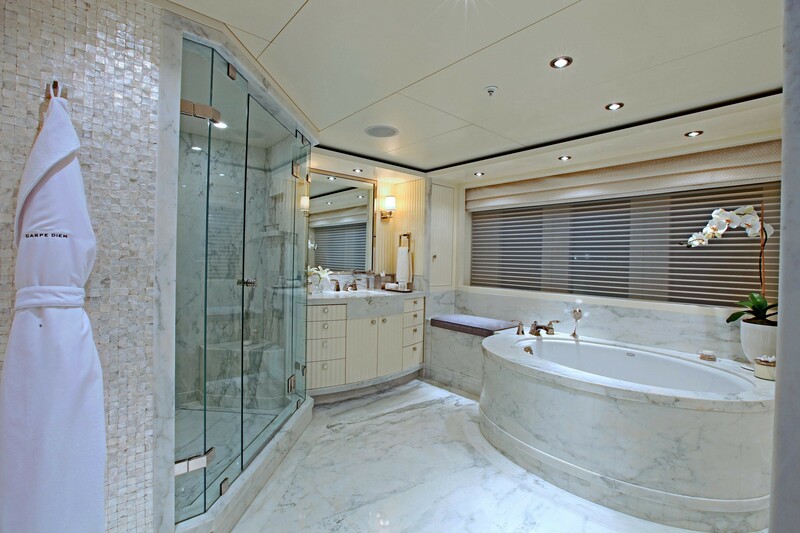 Forward on the main deck is the full-beam Owners' suite, featuring his and her bathrooms and a walk in closet. 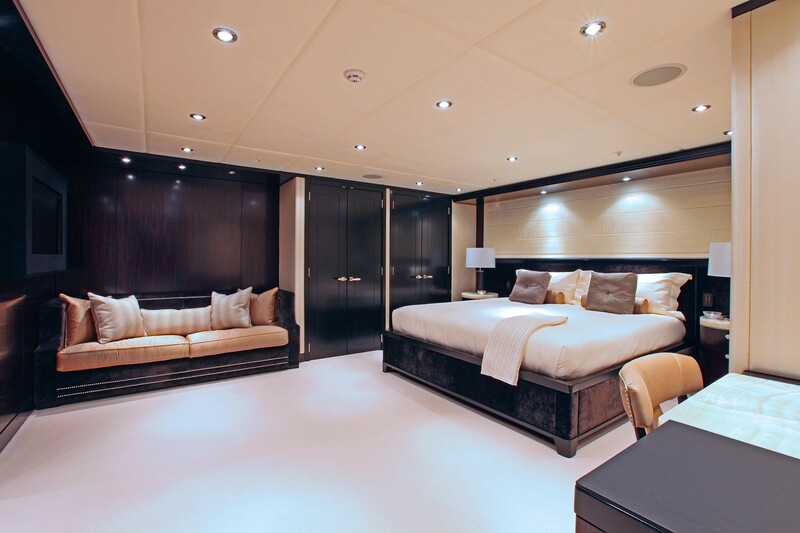 The guest cabins, on the other hand, are located on the lower deck, including four guest staterooms, and a gym, which can be converted into another additional guest room. 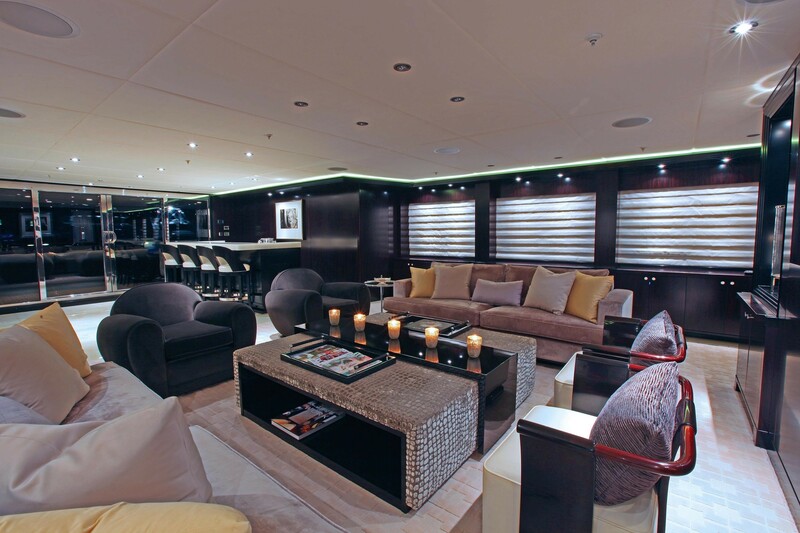 The upper level boasts a vast sky lounge and a bar offering comfortable seating for entertainment and great views. 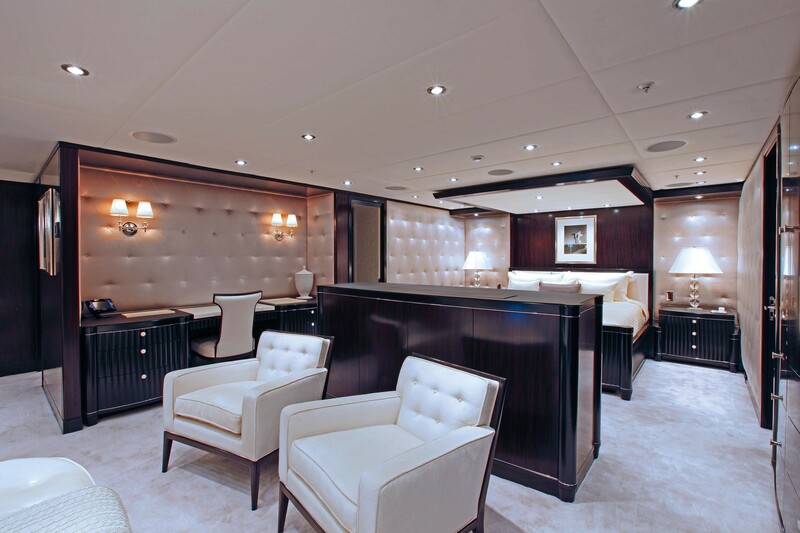 Forward of the sky-lounge is the Captain's cabin and the wheelhouse. 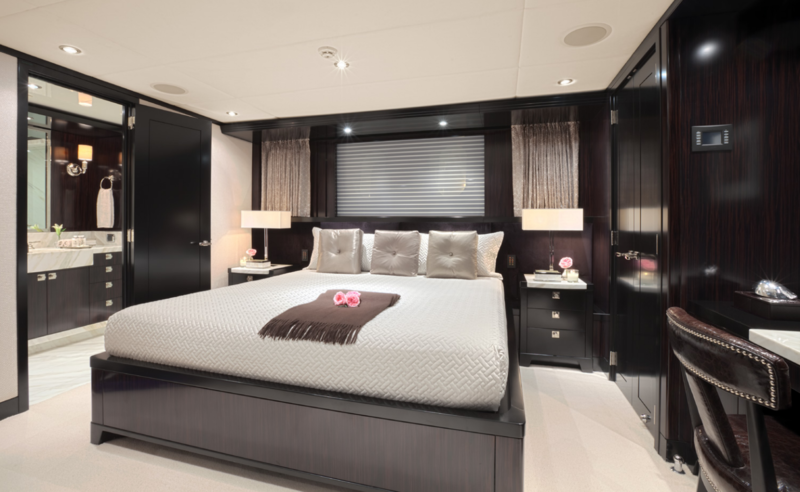 The engineer's cabin is situated aft of the engine room, while the remaining crew are accommodated on the lower level forward of the guest area. 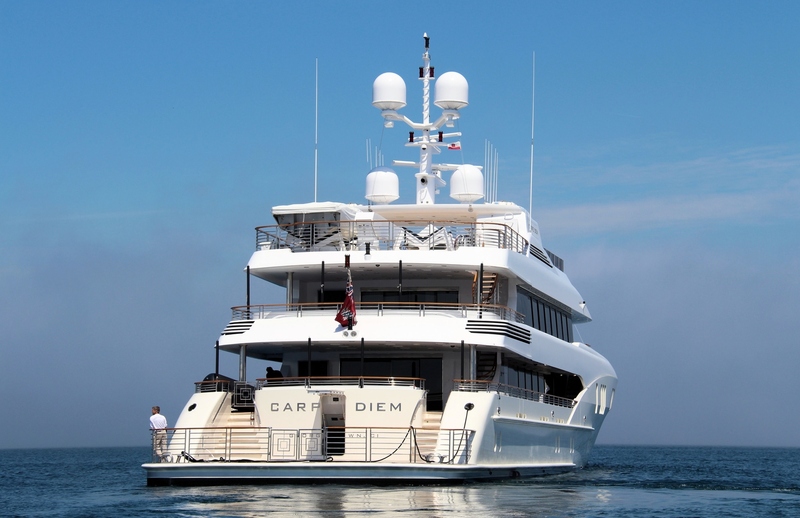 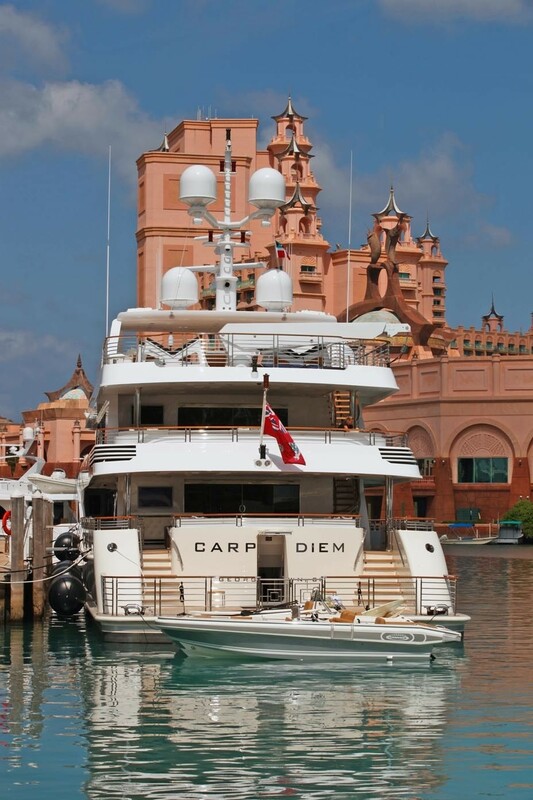 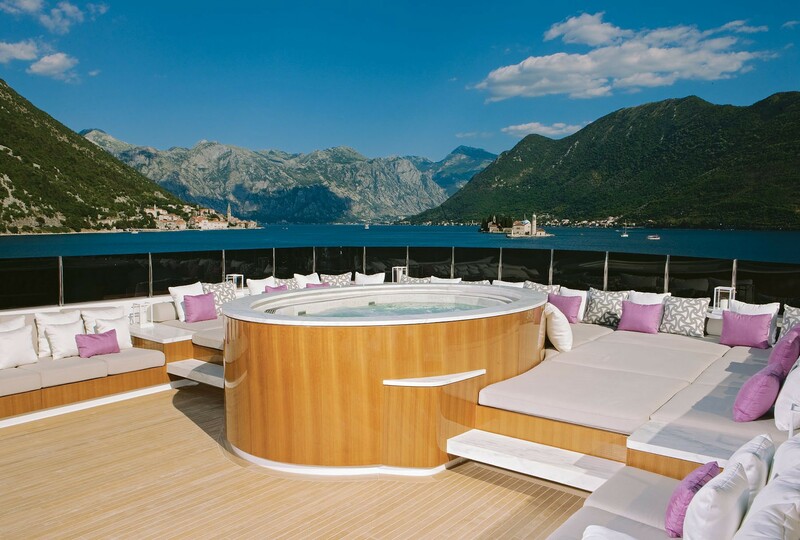 CARPE DIEM features a number of outdoor entertainment areas, including a large aft deck with a large al-fresco dining table and bar. 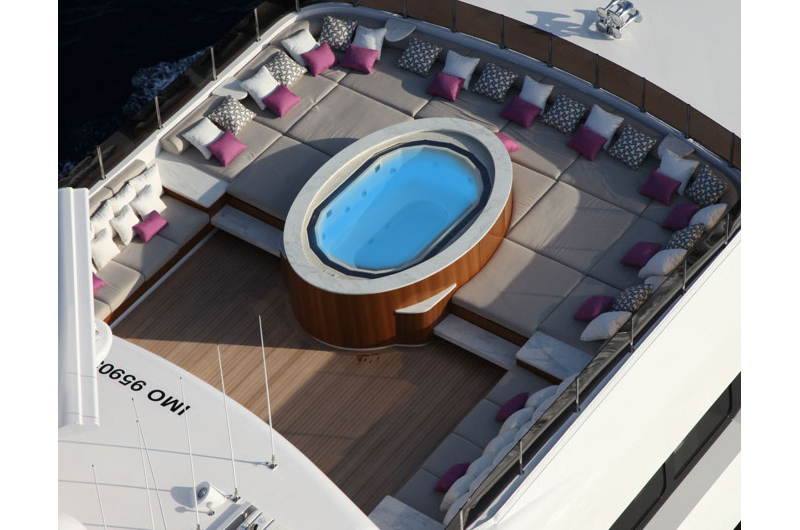 The upper deck offers another al-fresco dining option and fixed seating aft, together with a large Sun-deck with Spa Pool, sunbathing and seating areas, as well as another bar. 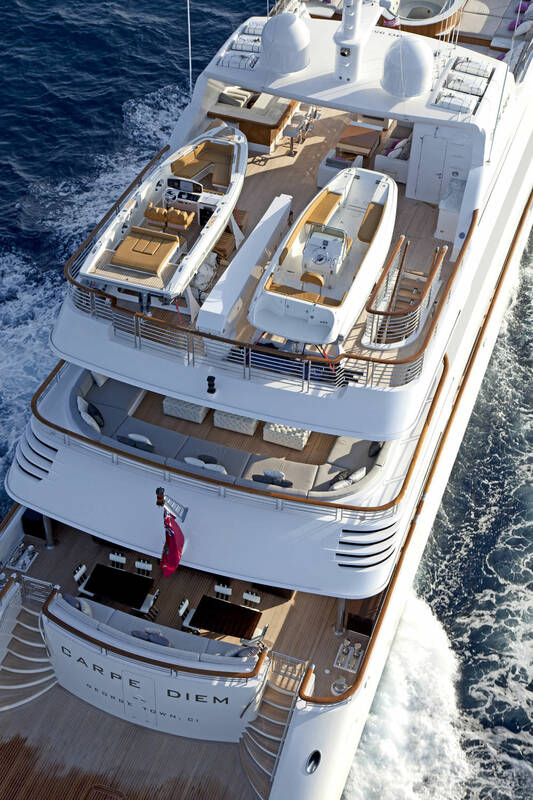 The tenders are stored on the sun-deck aft. 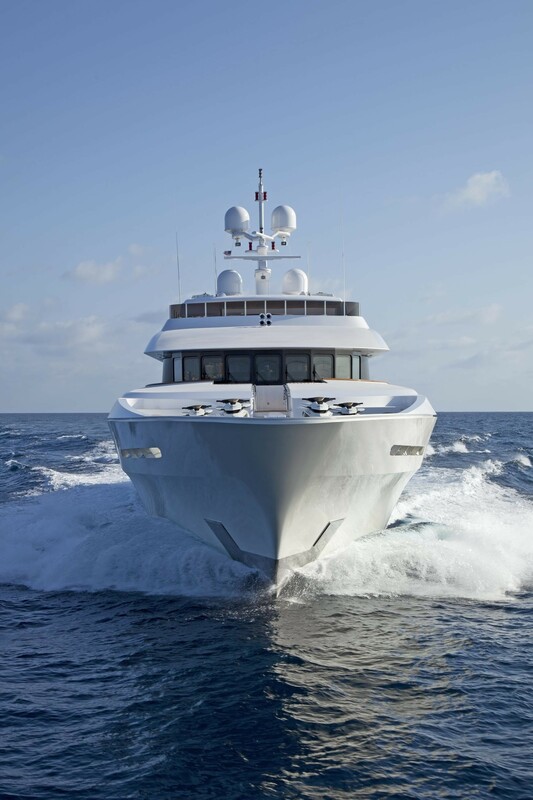 She is powered by twin CAT 3516 Series II HD dies engines with 3,384hp each. 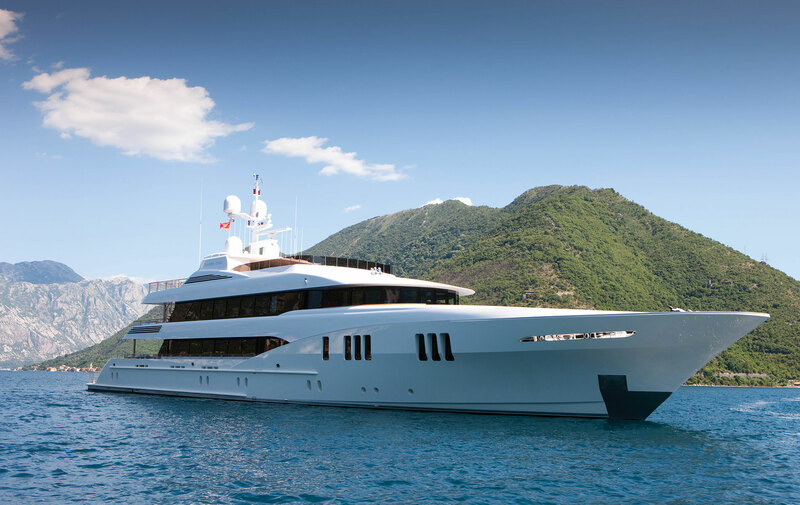 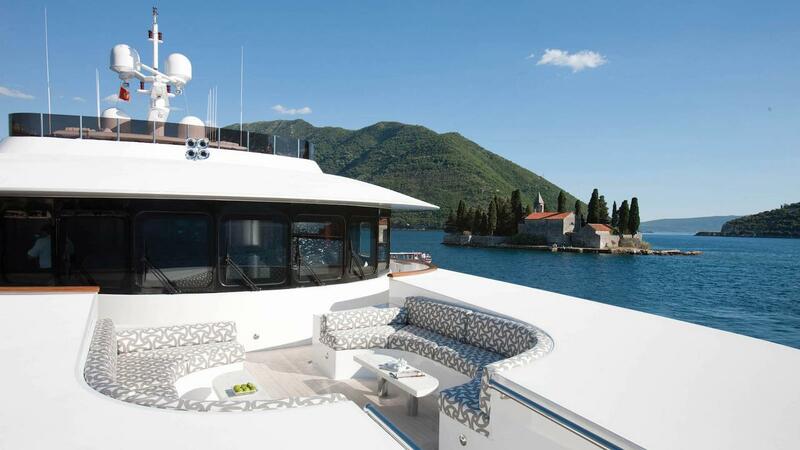 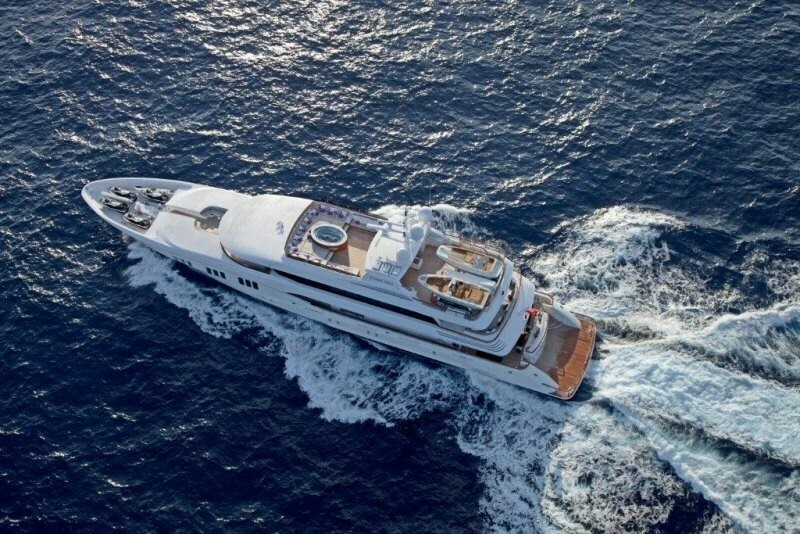 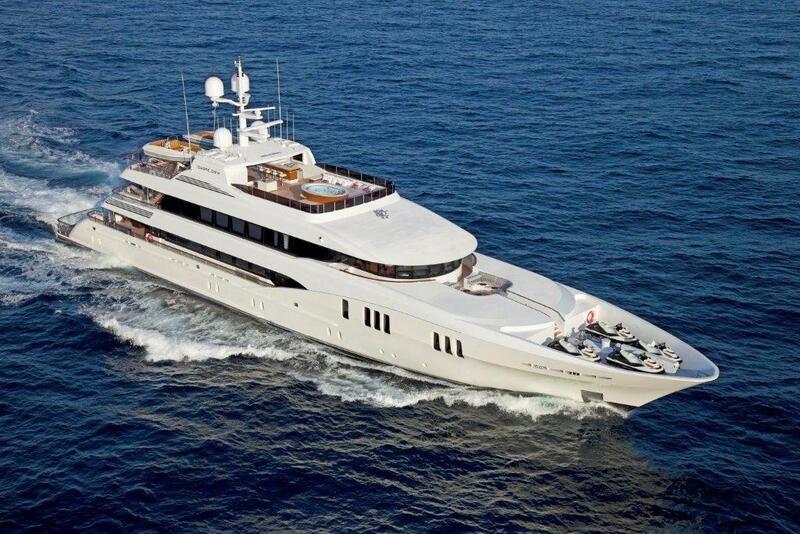 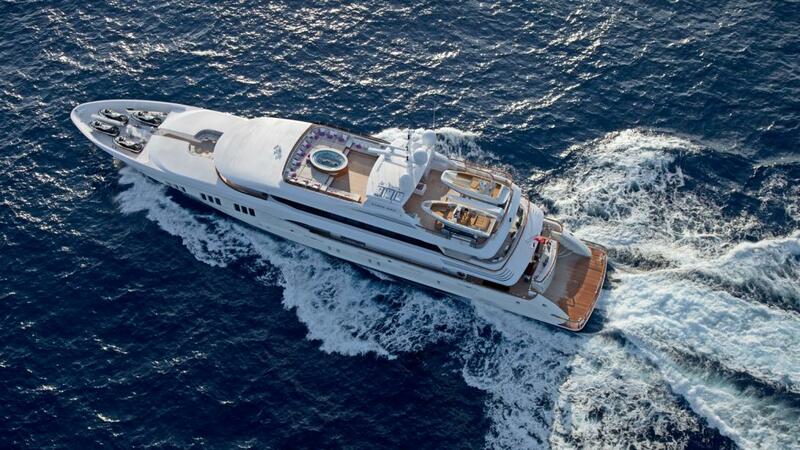 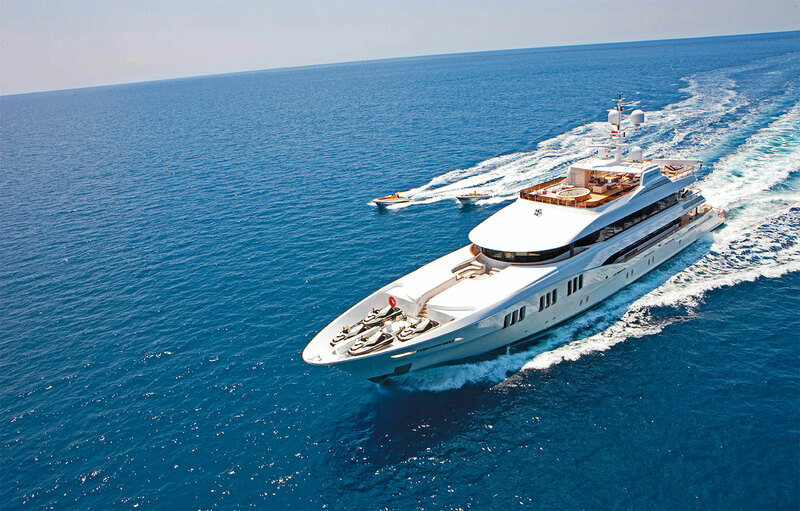 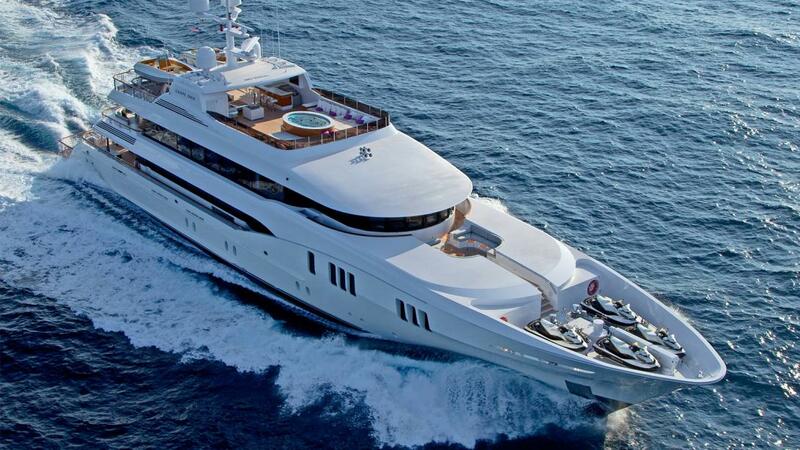 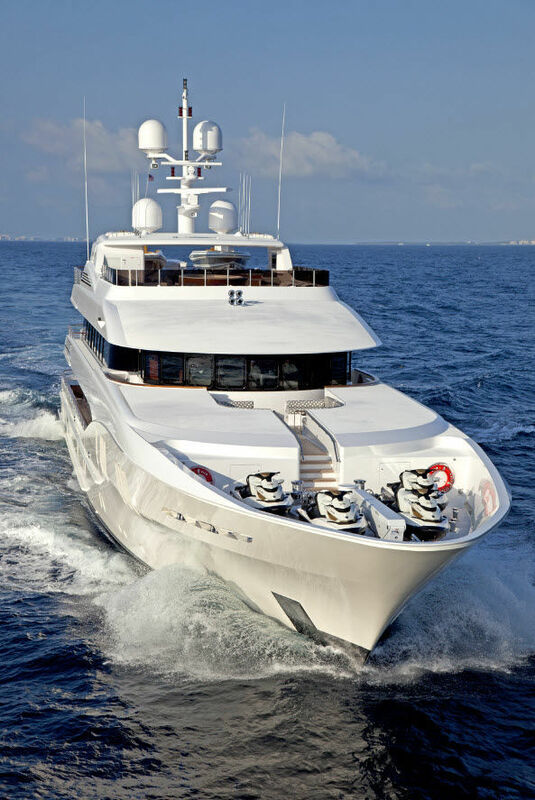 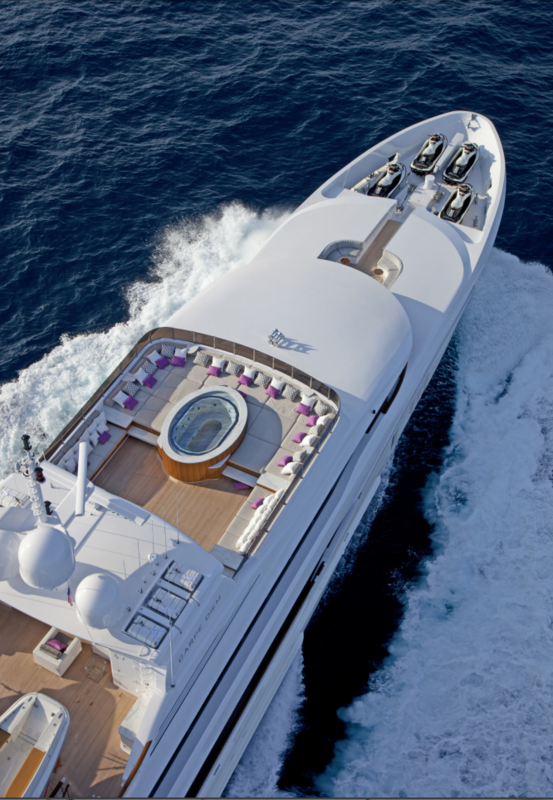 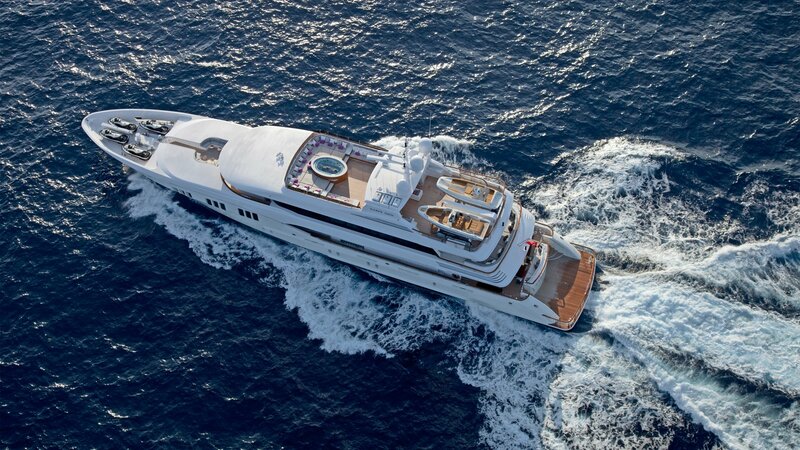 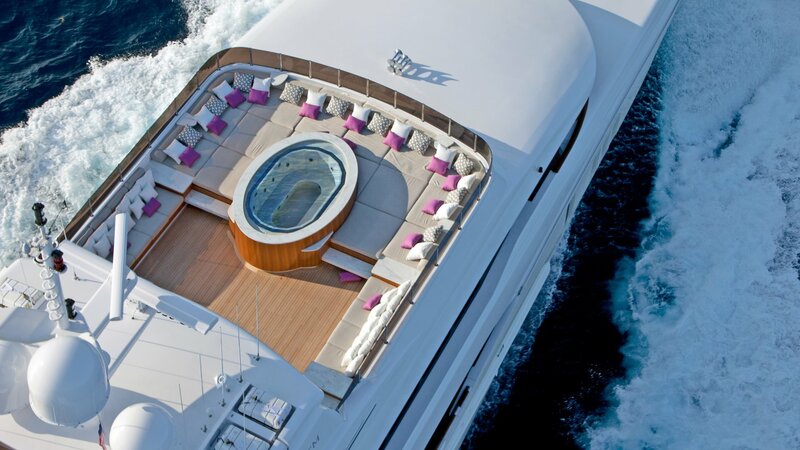 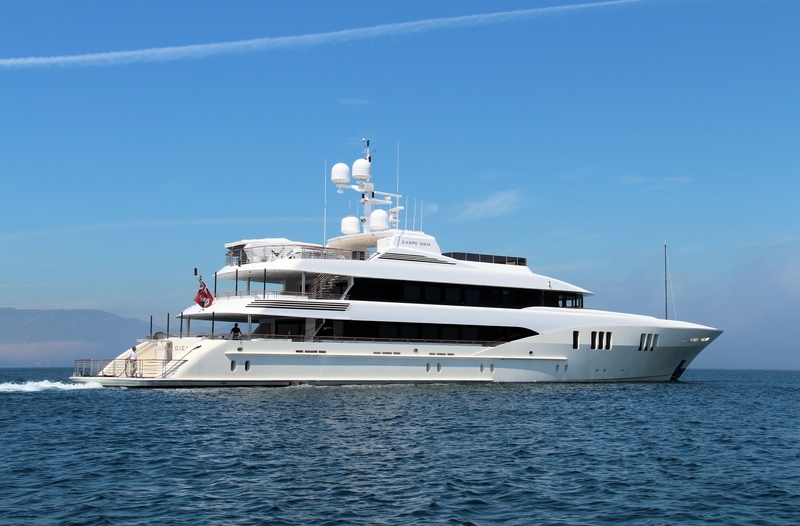 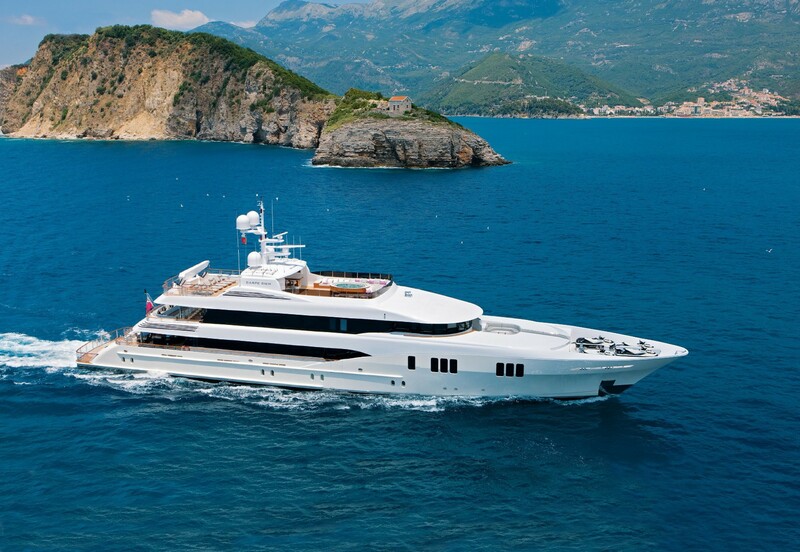 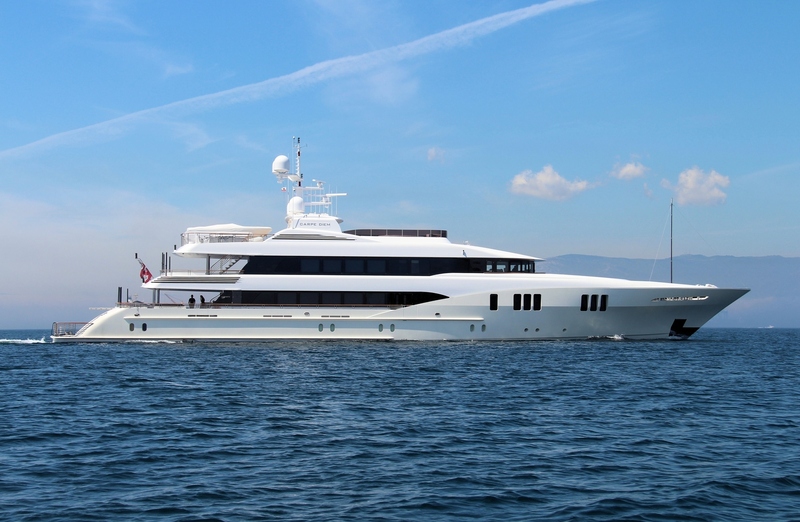 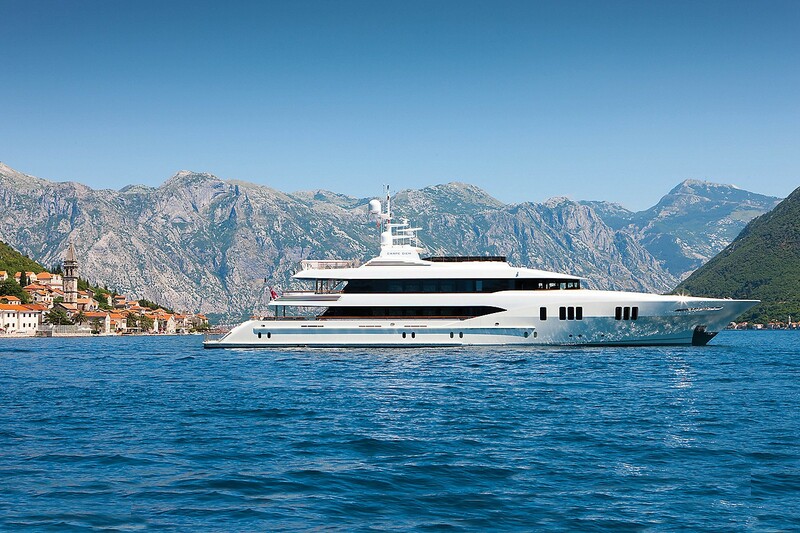 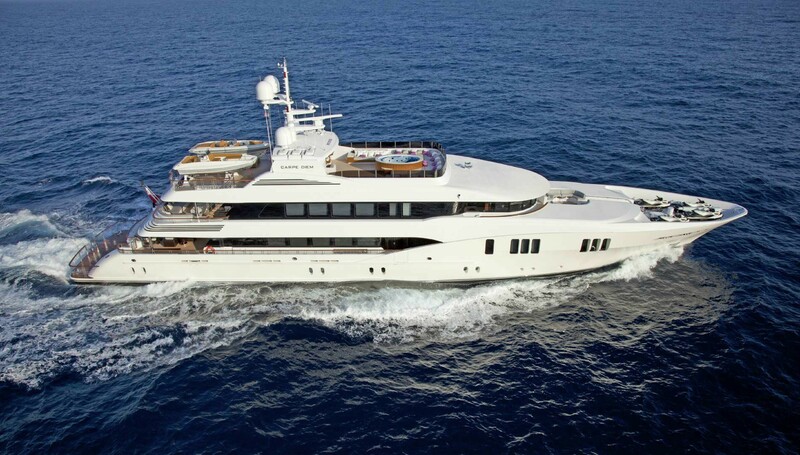 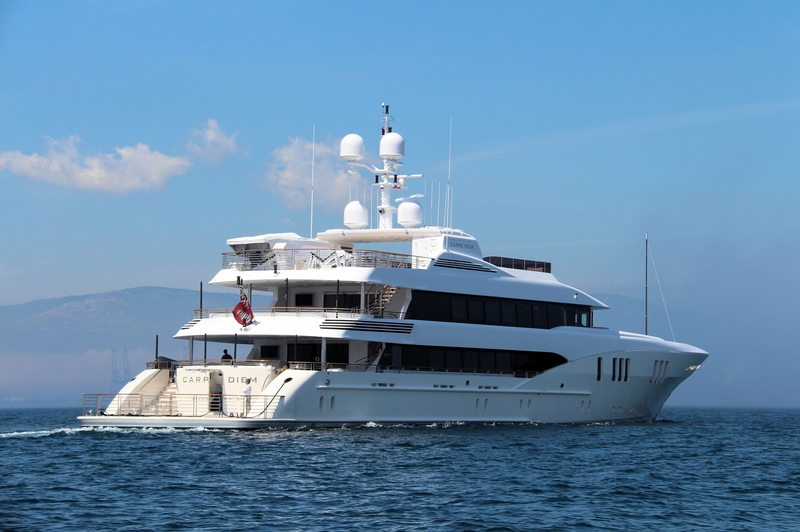 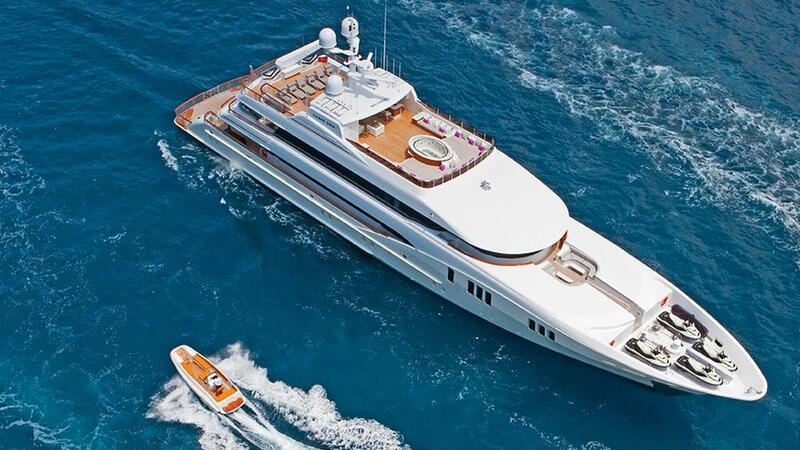 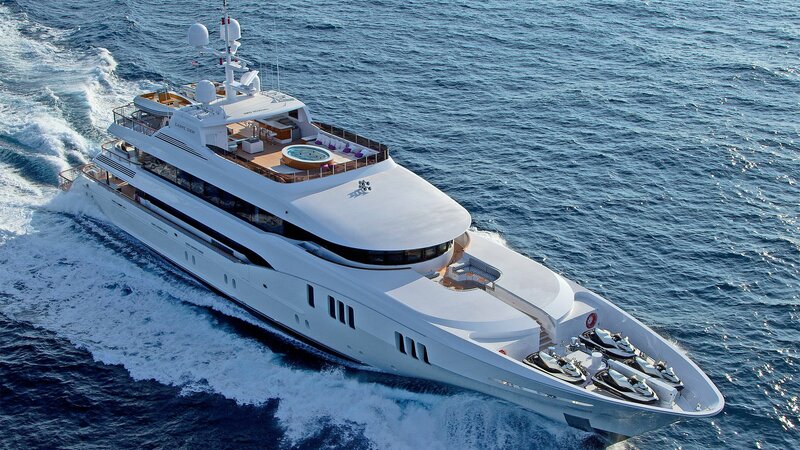 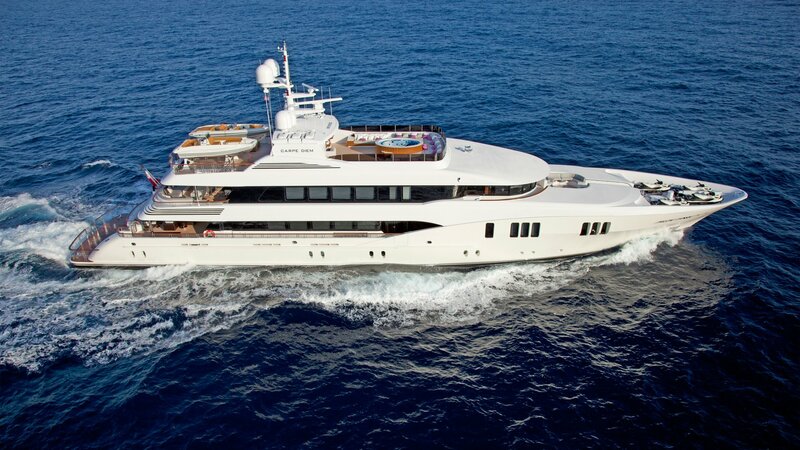 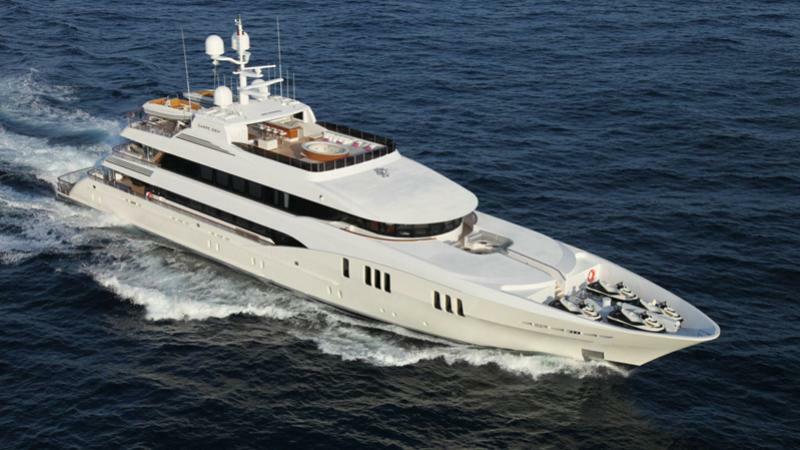 This amazing superyacht is classed under ABS Maltese Cross A1 Yachting Service, AMS, and MCA. 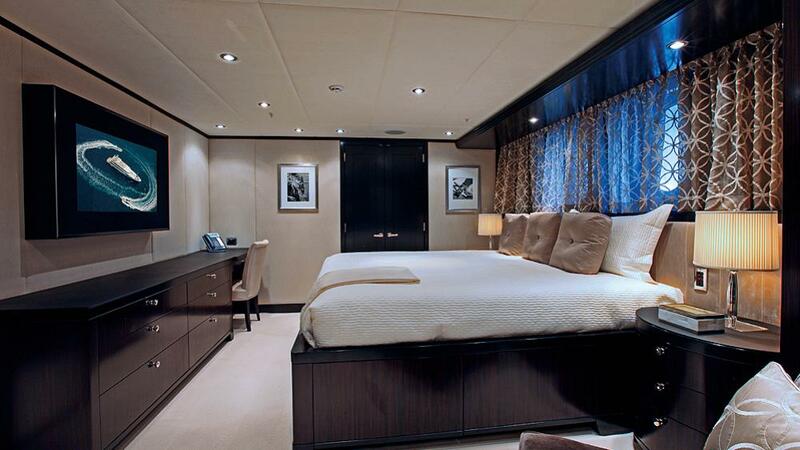 Accommodation is offered for 12 guests in 6 staterooms. 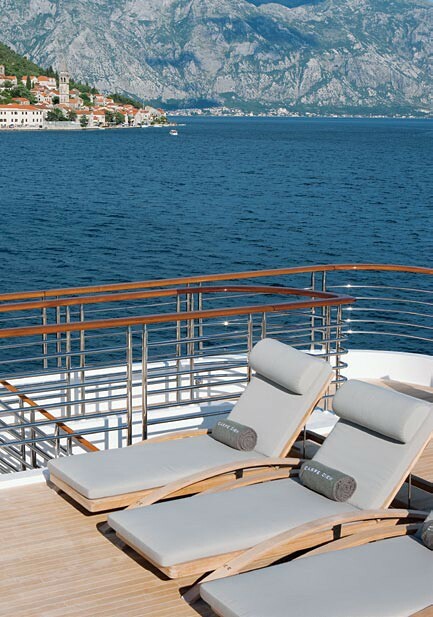 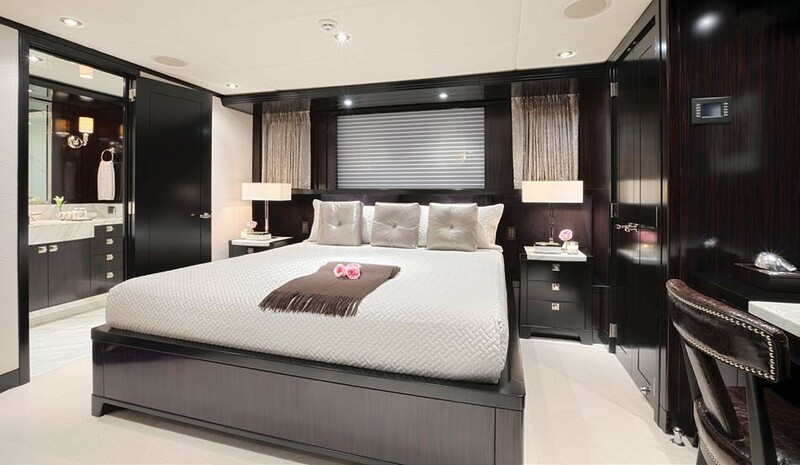 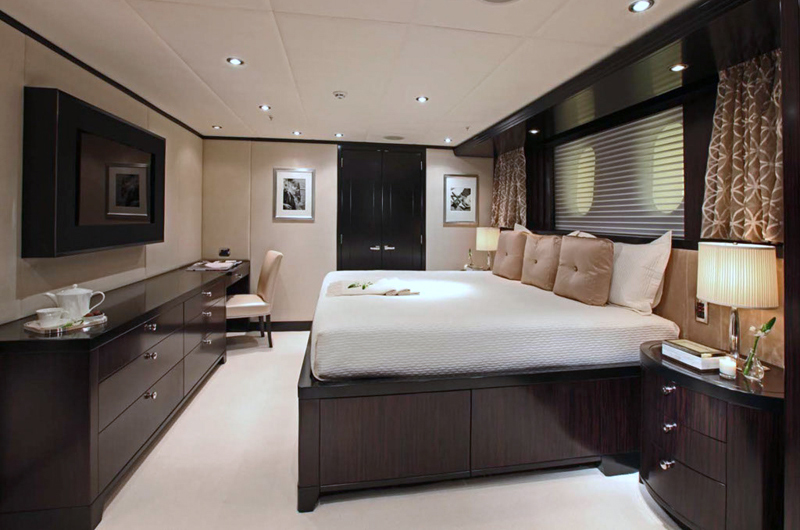 The full-beam owner's cabin is on the main deck, and features a King bed, his ad her shower facilities with Spa Pool. 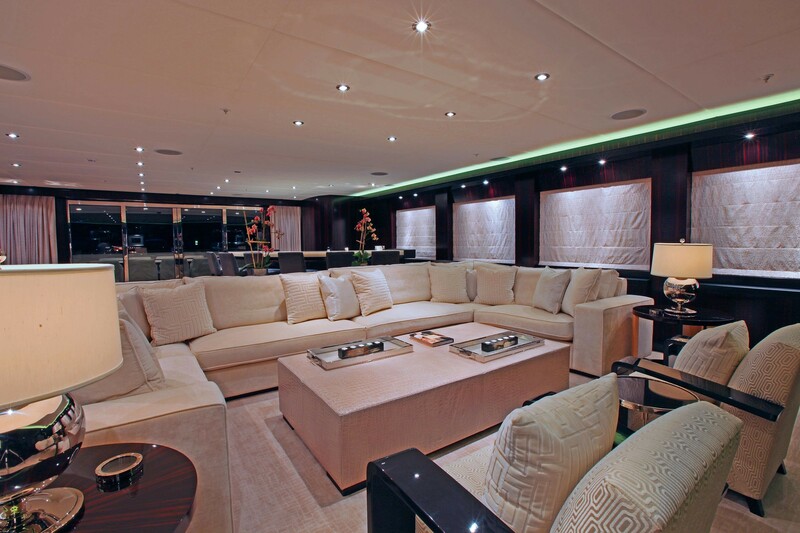 There is also a large walk-in closer, private study and sofa and arm chairs. 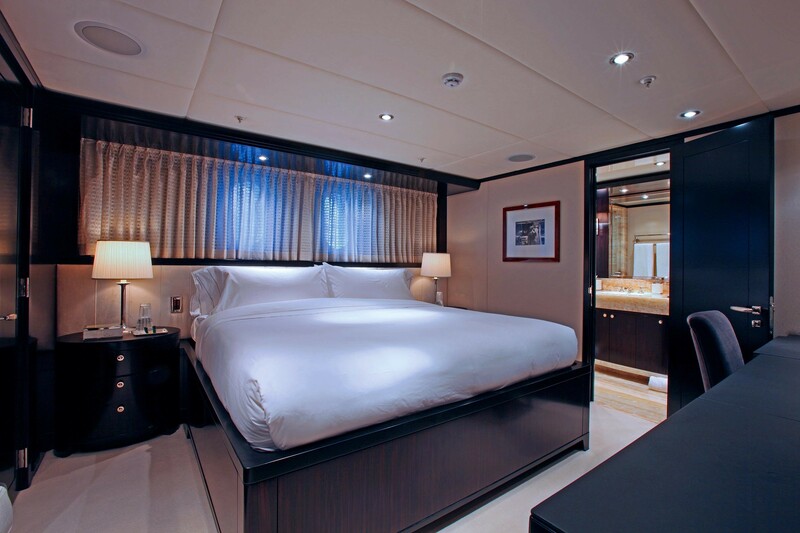 The full-beam VIP cabin has a King bed, sofa, vanity, and bathroom with double shower and Spa pool. 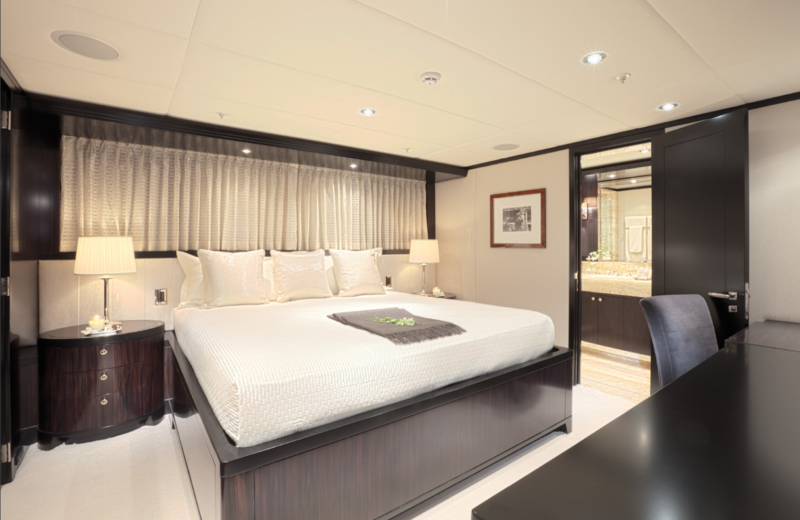 Three double guest statrooms, as well as one twin room (with two single beds and one Pullman) are located on the lower deck. 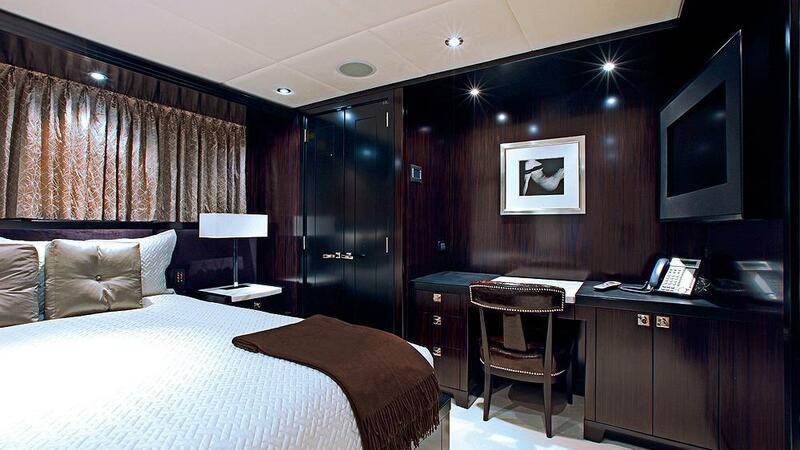 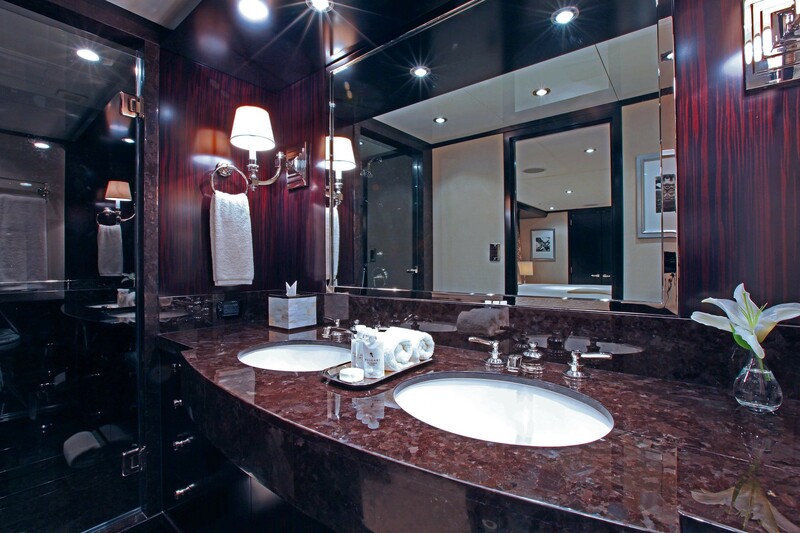 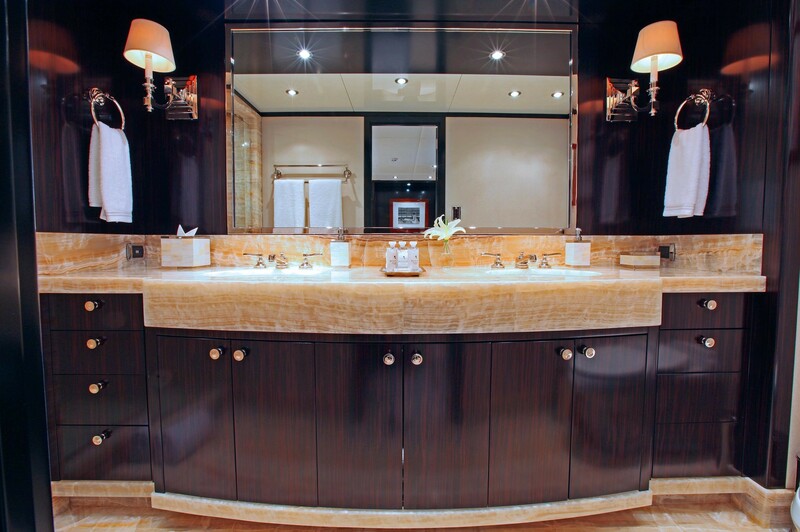 All cabins feature ensuite facilities.